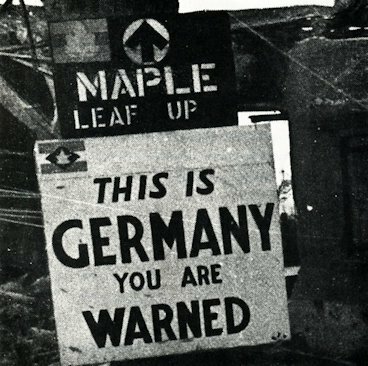 MAPLE LEAF UP was the first Canadian supply route to the North-West European front in 1944-1945. 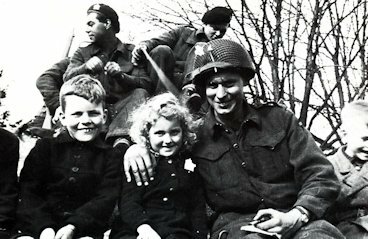 This page is about the liberation of the north of Holland by the Canadians in April 1945. A shield on the left bank of the Rhine in Germany marks the Canadian advance to the north. Balkbrug. 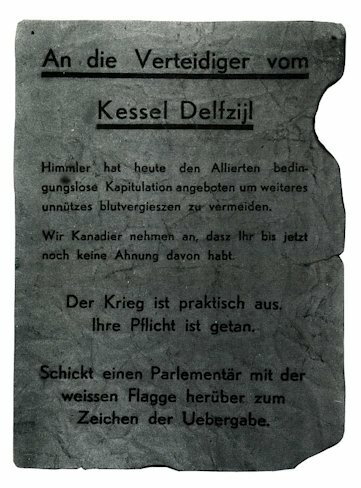 11 april 1945. 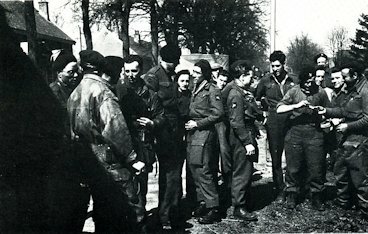 Men of The Fort Garry Horse en de Special Air Service paratroopers meet who were dropped in the night of 7 and 8 april 1945. 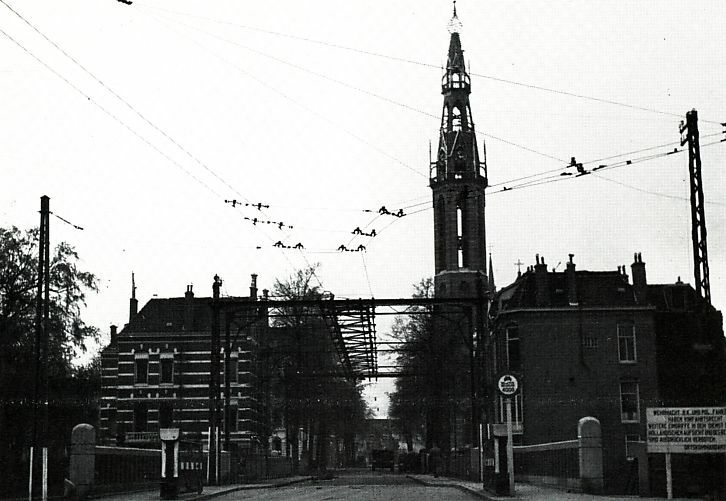 Balkbrug, 11 april 1945. 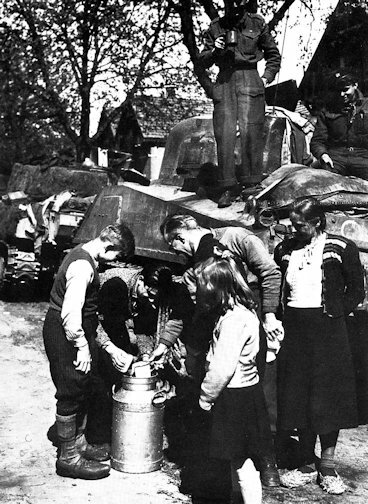 Milk for the Canadian liberators. 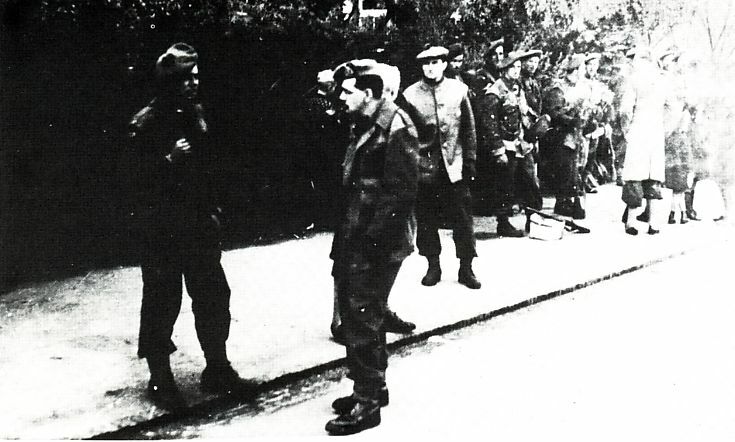 Major L. H. Brown of the 7th Field Company, Royal Canadian Engineers in discussion with a member of the underground by a temporarely bridge across Demensvaart made by civilians and military. The Regina Fifle Regiment with a prison SS sniper. The Canadian Engineers where well equiped and armed. Canadian cemetary with 6 graves on 12 en 13 april 1945 in Assen en Hooghalen. 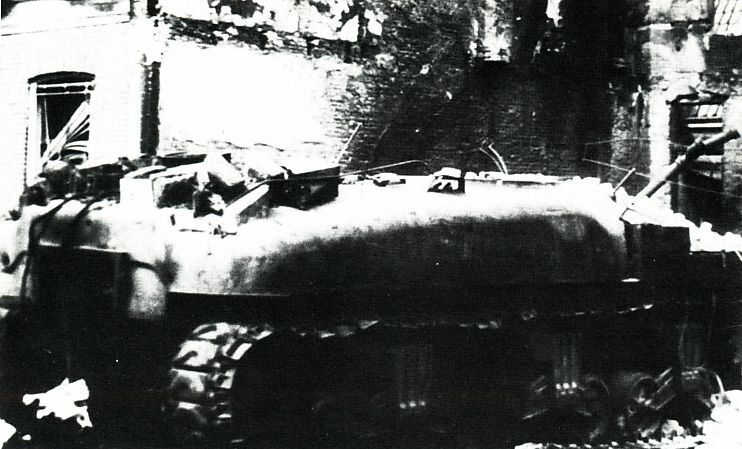 The tank was shot by a Panzerfaust, one men was killed. 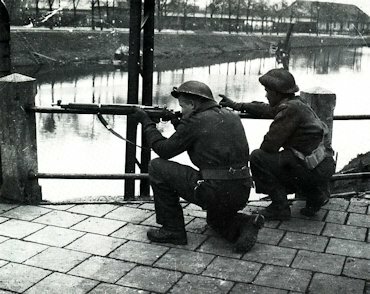 Assen, 13 april 1945.. Fighting at Groningerbrug. 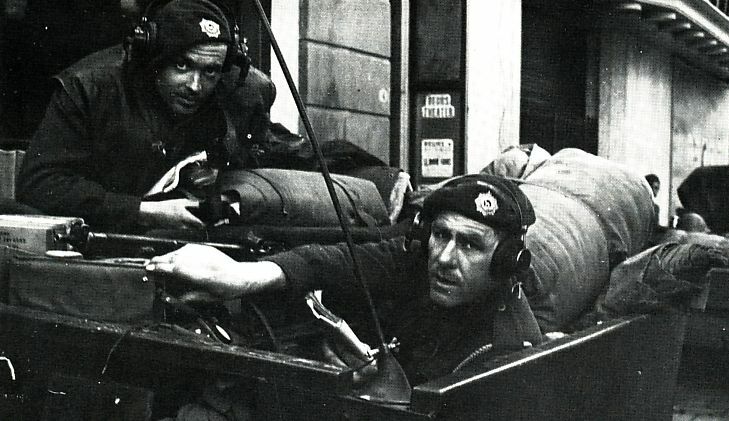 Some soldiers of Essex Scottish Regiment are wary for snipers. 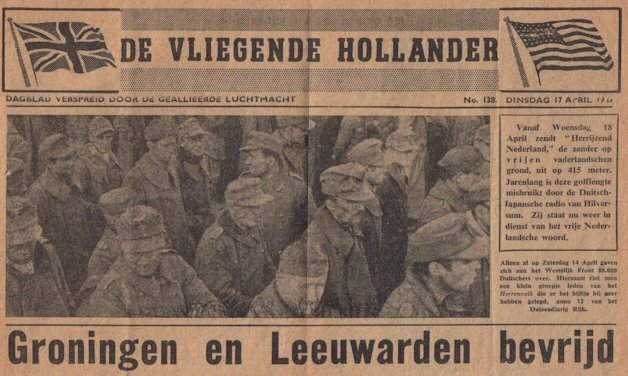 De Punt, 13 april 1945. 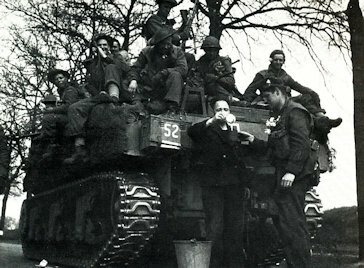 The Royal Hamilton Light Infantry is surprised with a delicious cup of milk. De Punt, vrijdag 13 april 1945. 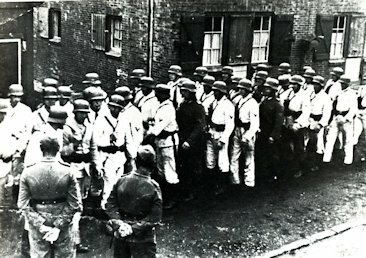 German prisoners. De Punt, 13 april 1945, in the triple jump Eelde Glimmen-Vries. 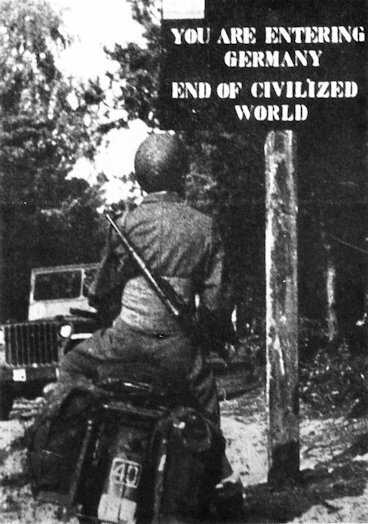 On the forground a soldier of the Royal Hamilton Light Infantry (Wentworth Regiment) with an Enfield rifle, with banded equipment under the net of the helmet. Triple jump at De Punt. Firefly Fort Garry Horst fires with 17-pounders in the direction of the water pumping station. 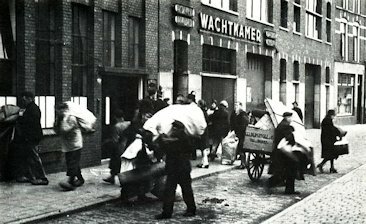 De Punt, vrijdag 13 april 1945 at noon. 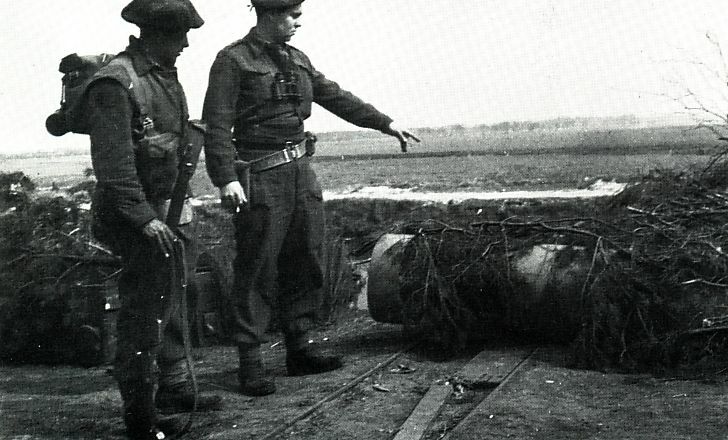 The Canadians found 500 kg bombs and ammunition for Eelde airport at the end of the narrow passage. On the photograph Captain R. W. Wight and soldaat WJ King. De Punt, 13 april 1945. after studying the map the advance to Groningen was continued. Opmars langs een brandende boerderij en uitgebrande voertuigen. Advance along a burning farm and burned-out vehicles. 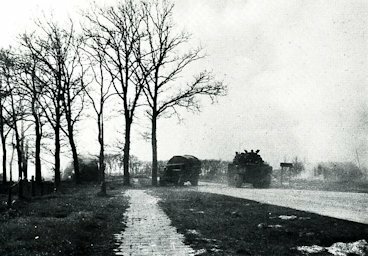 Burned-out German convoy south of Eelde airport. Roadblock on the triple jump Groningen-Assen-Eelde near the bridge across Noord-Willemskanaal. Eelderwolde. Soldiers of Essex Scottish Regiment flooded with tulips. 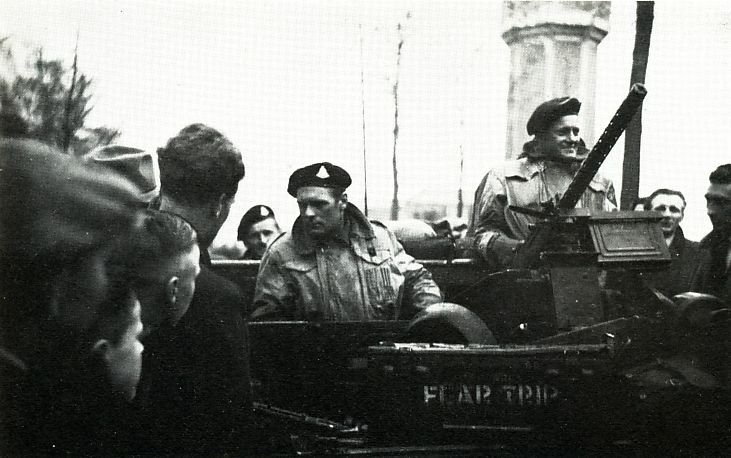 Eelderwolde, vrijdag 13 april 1945., Firefly with members of the Royal Hamilton Light Infantry (Wentworth Regiment). 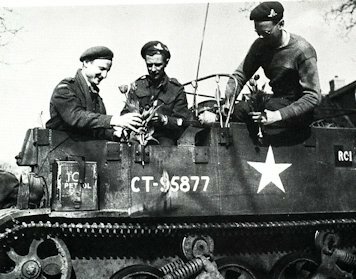 With camouflaged 17-pounder gun.Behind the tank a jeep of 2nd Field Company, Royal Canadian egineers. 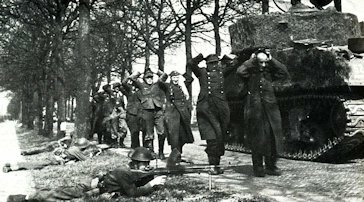 Eelderwolde, vrijdag 13 april 1945. 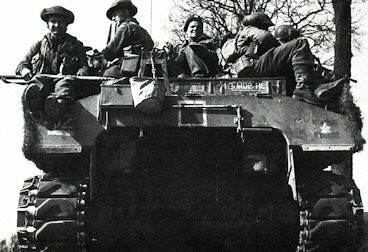 C squadron 1st Canadian Armoured Personell Carrier Regient, 79th Armoured Division on the way to Groningen with soldiers of Royal Hamilton Light Infantry (Wentworth Regiment) in their Kangaroos. 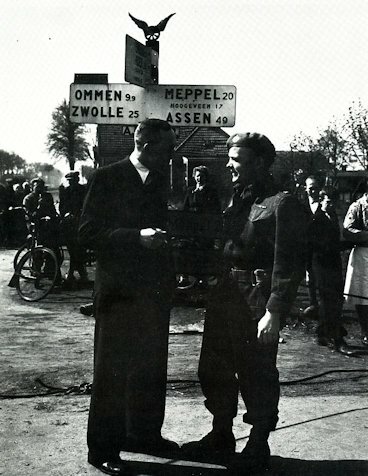 Eelderwolde, vrijdag 13 April 1945. 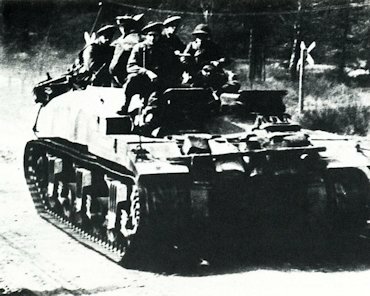 A carrier of the 4th Field Regiment RCA 2nd Battery. The carrier is a Canadian Windsor. 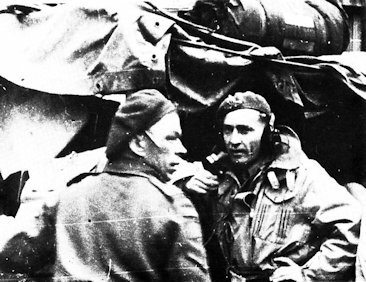 From left to the right Lt. Heaps, Gunner R. Bagne and Bombardier M. K. Oliver. Groningen, corner Grunostraat, Paterswoldseweg. 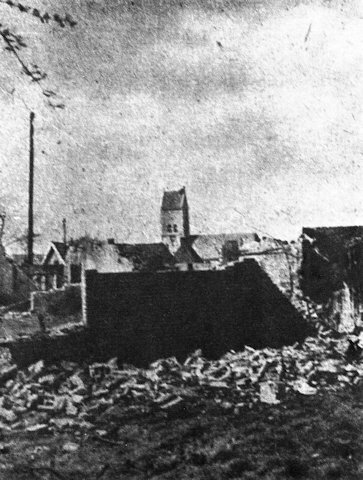 Damage by granades of tanks, that tried to storm into the city. 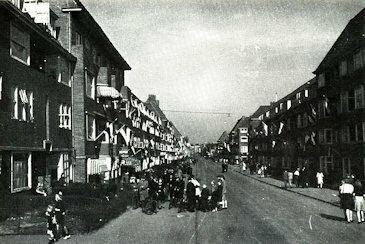 Groningen, Paterswoldseweg, Saterday 14 April 1945. 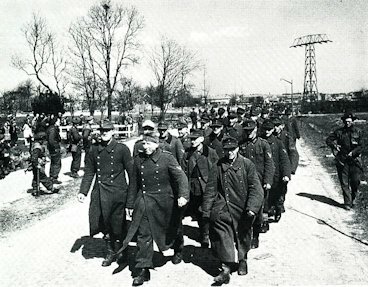 German Prisoners of War. 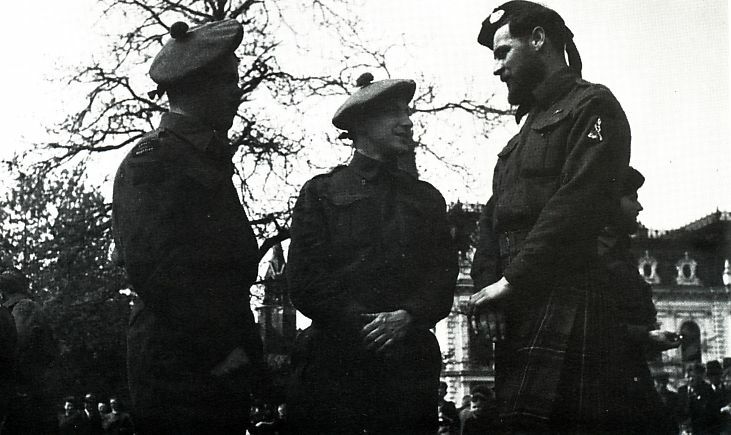 On the left a soldier of Essex Scottish Regiment leaning on a 2 inch morter. 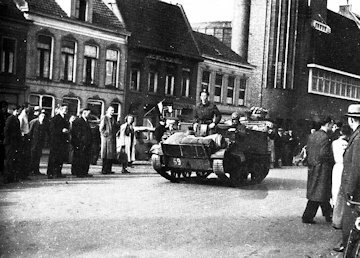 Groningen, Paterswoldseweg, Saturday 14 April 1945. Soldiers of Essex Scottish Regiment at a anti-tank wall, broken by a 3,7 inch gun. PIAT, Projector Infantry Anti Tank. 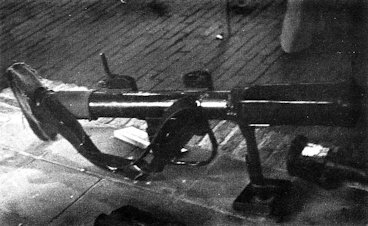 The British counterpart of the German Panzerfaust. 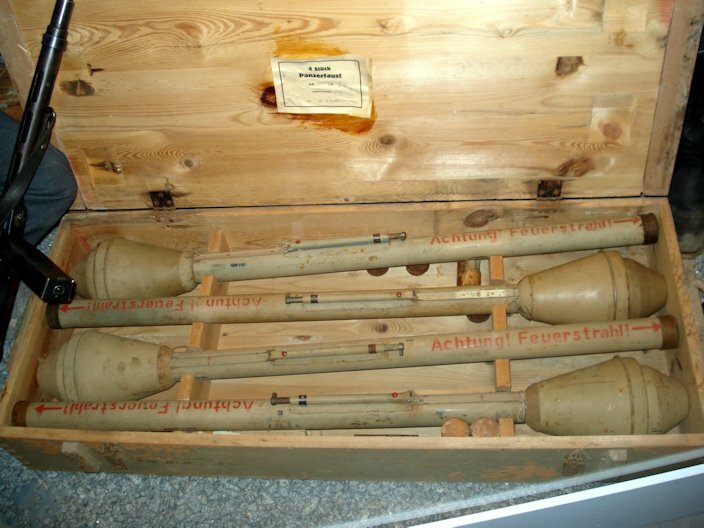 The German Panzerfaust, used in a desperate attempt to stop the allied tanks. 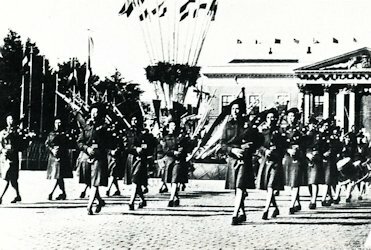 Paterswoldsweg, Saturday 14 april 1945. 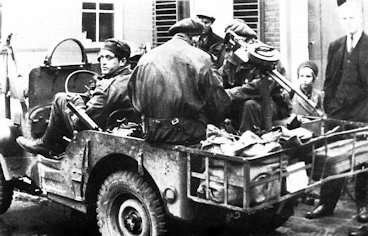 Soldiers of Essex Scottish take cover against snipers at a disabled truck of the Grüne Polizei. Paterswoldsweg, Saturday 14 april, 1945. 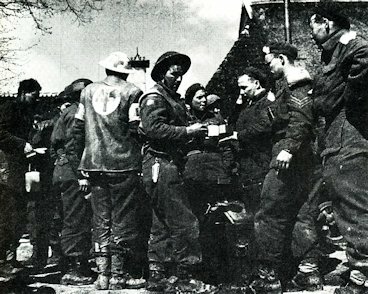 Canadians of The Royal Hamilton Light Infantry (Wentworth Regiment) who foughht in Stadspark vochten, return for their first warm meal. 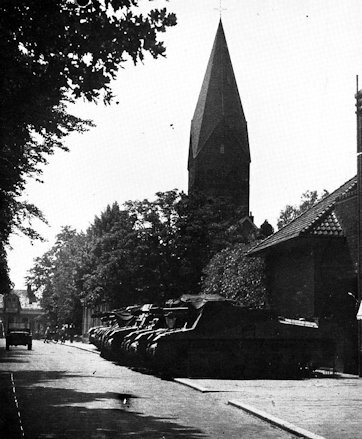 Groningen, Paterswoldeweg, 14 april 1945. Large numbers of Germans gave up the war. 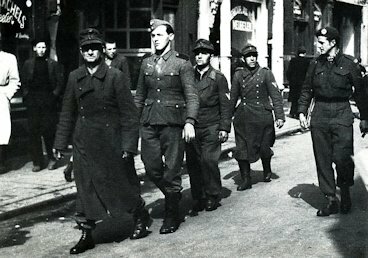 Groningen, 14 april 1945, Paterswoldseweg. 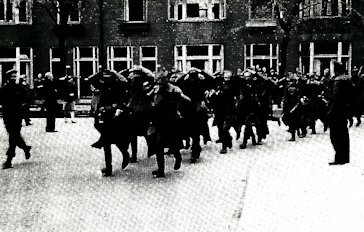 More and more German prisoners. 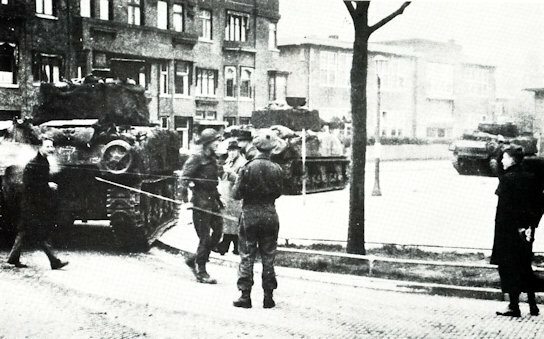 Groningen, 14 april 1945, Paterswoldseweg. 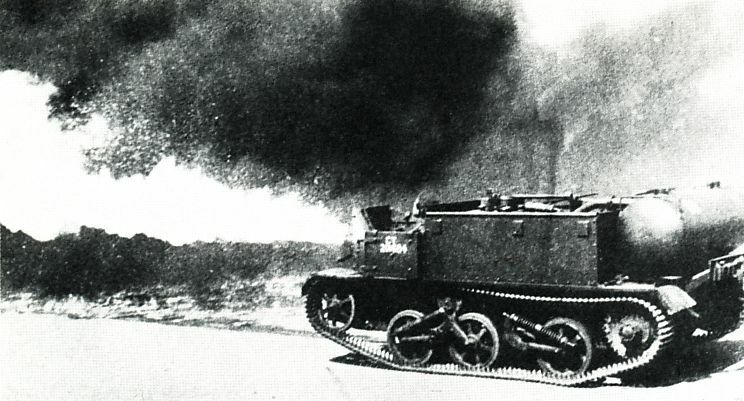 The tank of Sergeant Chaulk hit by a Panzerfaust. The tank caught fire, whereby the block of houses caught fire. 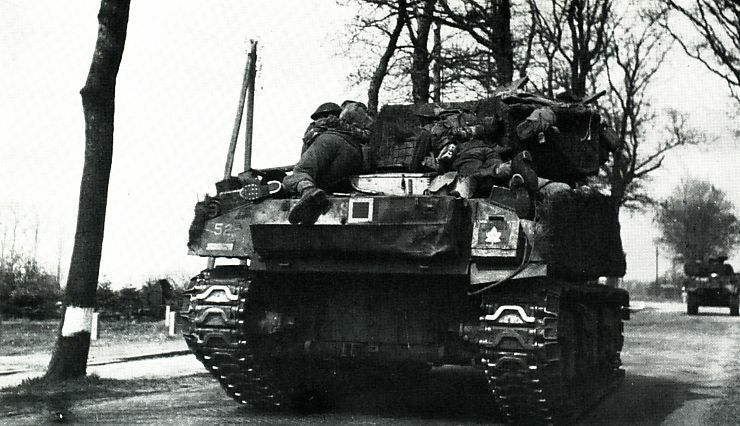 In this tank tankdriver Butterworth was killed. Groningen, Paterswoldseweg. Saturday in the afternoon of 14 april 1945. 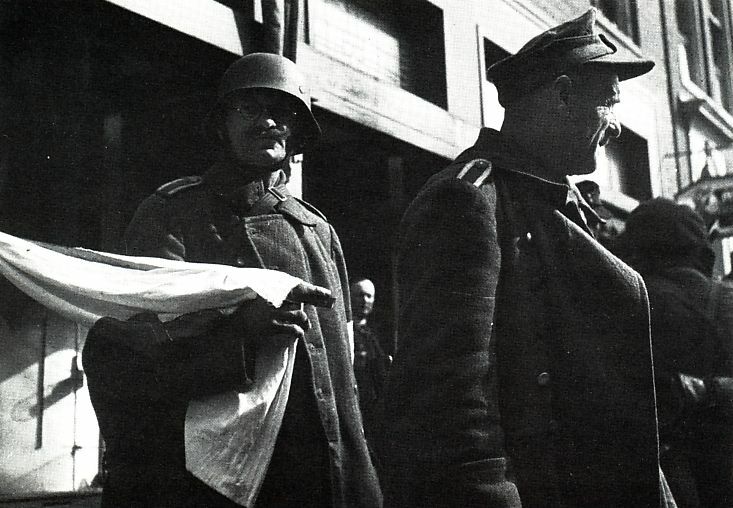 Lt. Dave Heap of the Royal Canadian Artillery watching the shields of the Wehrmacht when he entered the city. 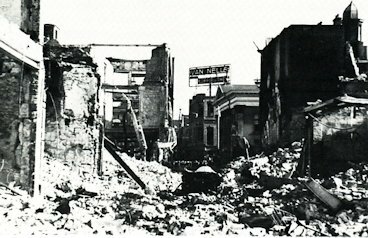 Right the burned-out block of houses. None of these houses remained without damage during the fighings on Friday. 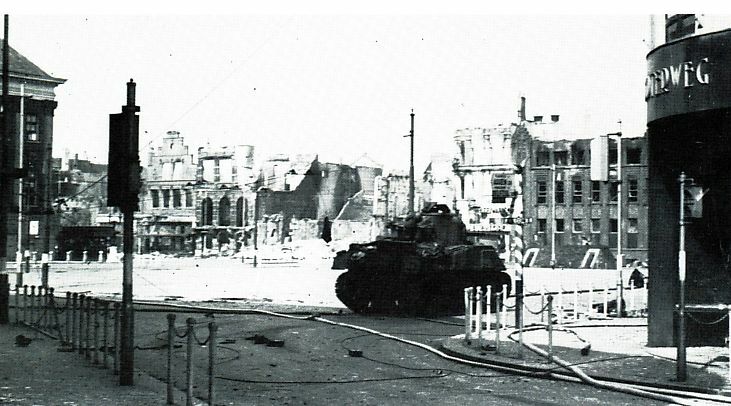 Left on the middle of this picture the grave of Butterworth, killed in his tank that caused the fire in the block of houses in the background. 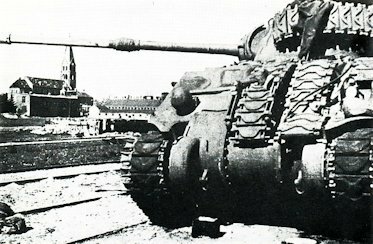 The tank was hit by a Panzerfaust on Friday 13 April 1945. Paterswoldseweg. Saterday in the afternoon of 14 april 1945. Great damage in this neighborhood. On the right Aan de rechterkant drugstore Wiersma with a full hit. Left the burned-out Café De Ruyter with a lot of hits. 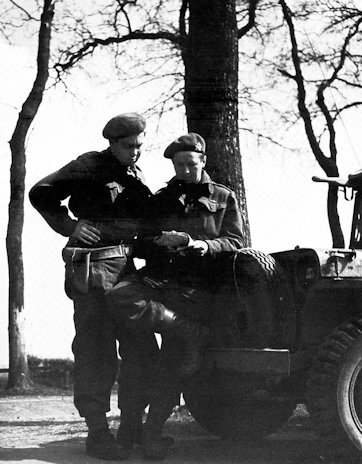 The jeep belongs to 2nd Canadian Armoured Brigade's Light Field ambulance, of Fort Garry Horse. Civilians were already on the street in spite of the shooting all around them. Stephonsonstraat. Saterday in the afternoon on 14 april 1945. Paterswoldseweg. 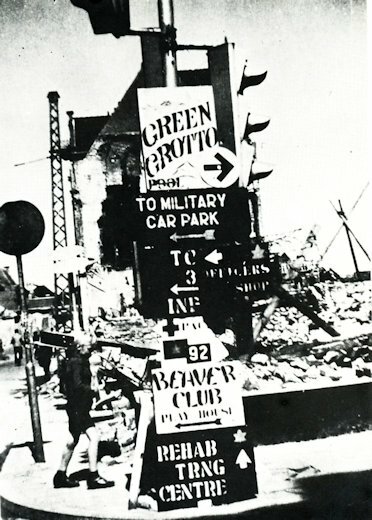 Saterday in the afternoon of 14 april 1945 around two o'clock. The Essex Scottish Regfiment. Paterswoldseweg. 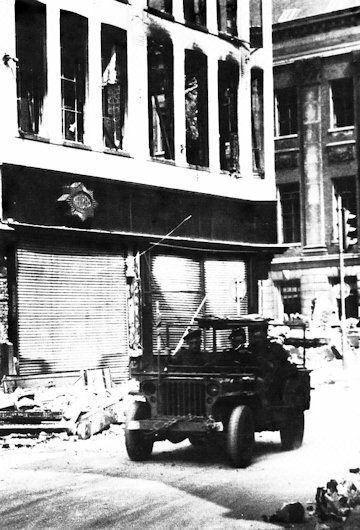 Saterday in the afternoon of 14 April 1945. Soldiers of The Royal Hamilton Light Infantry (Wentworth Regiment). Paterswoldseweg. Saterday in the afternoon of 14 April 1945. Het Wentworth Regiment in advance to zeeheldenbuurt. Night fire from Paterswoldseweg in Groningen. 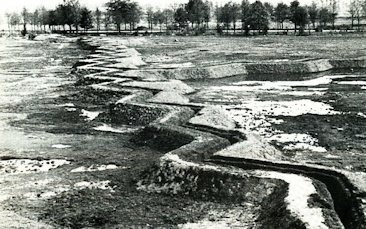 Stadspark in Groningen with trenches, April 1945. 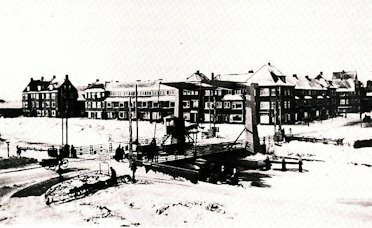 Parkwegbrug in Groningen, the first main target of the Canadians, 14 April 1945. 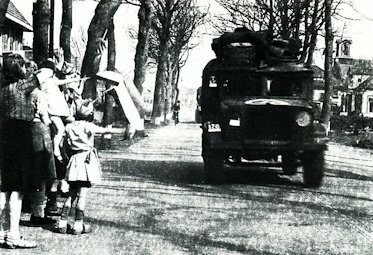 Canadians of The Royal Regiment advance along Parkweg, where they came suddenly under German fire. 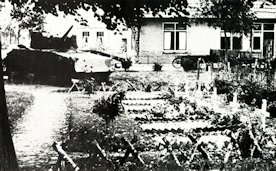 At that place Pte Clarence Milner was killed, whose remains on a stretcher stands in the garden. 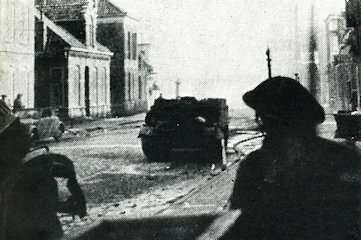 Groningen, 14 April 1945. 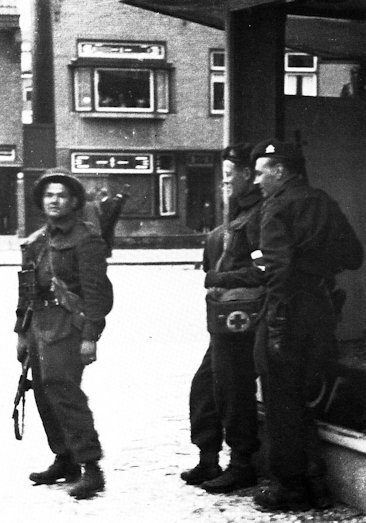 Een carrier with Browning Machinegun of the Essex Scottish Regiment on the steps in Rabenhauptstraat. 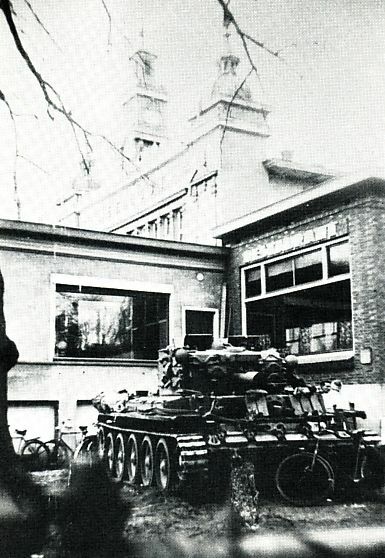 Groningen, 14 April 1945. 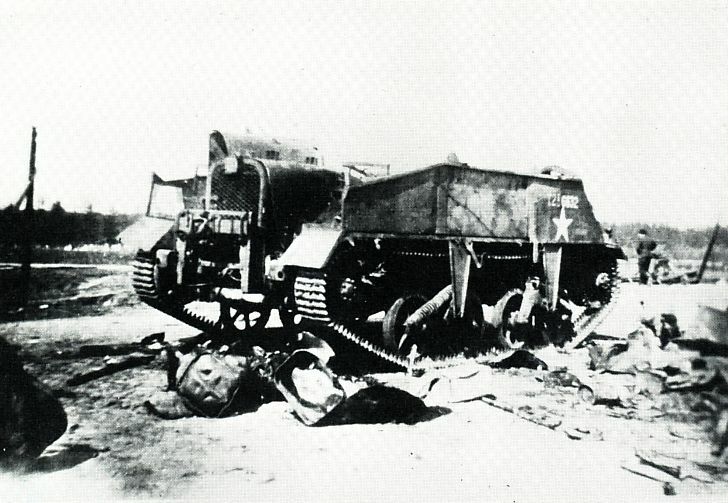 German staff car at Ubbo Emmiussingel hit by a 25-pounder granade. Picture taken from the roof a the house of mister Hoekstra at Abel Tasmanplein. The smoke comes from the burning house hold school at Kraneweg. Groningen, 14 April 1945. Canadians in Haren. 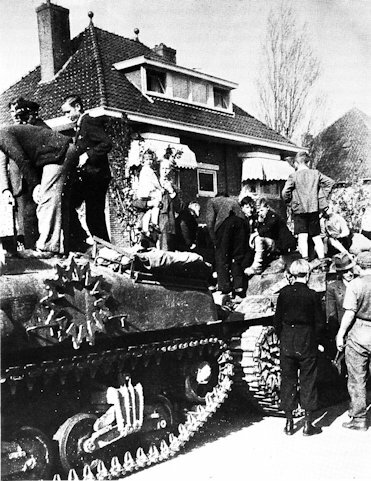 Haren, 14 April 1945. Firefly on Middelhorsterweg. 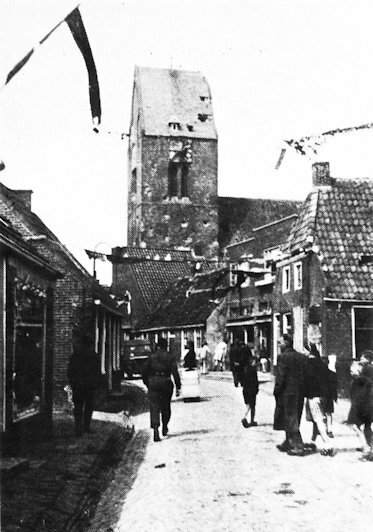 Haren, 14 April 1945. The village is liberated by The Fort Garry Horse. 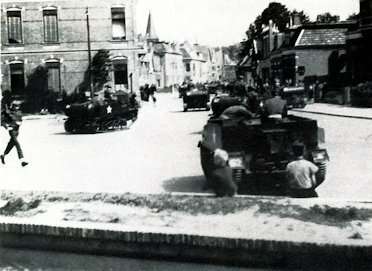 Haren, 15 April 1945. 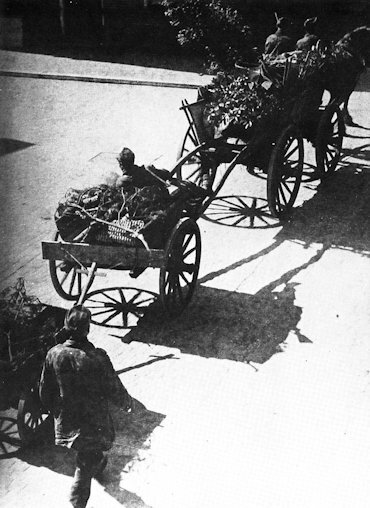 At noon a number of six Fireflies of The Fort Garry Horse are parket in the Kerkstraat. 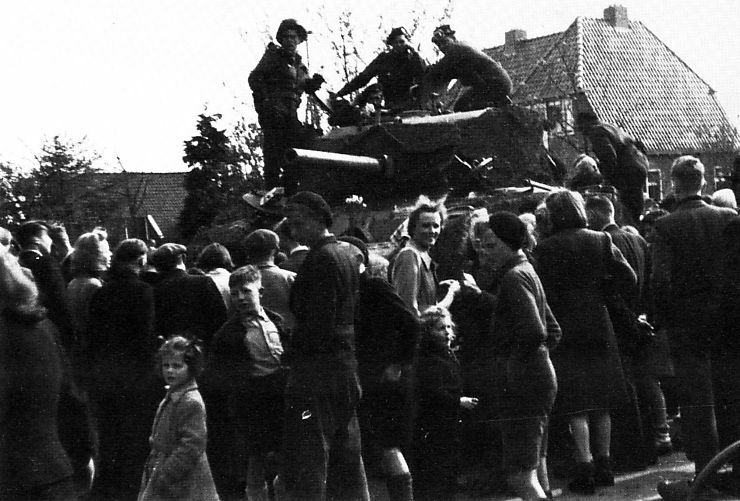 Haren, 14 April 1945. 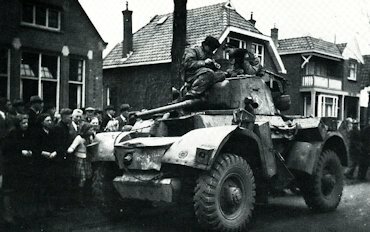 A Firefly that participated in the liberation of the village is made ready to return to Paterswolde. Groningen, 14 April 1945. 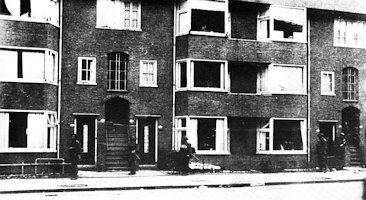 On the corner Abel Tasmanstraat and de Peizerweg two infantery men and a soldier of Red Cross of The Royal Hamilton Light Infantry. 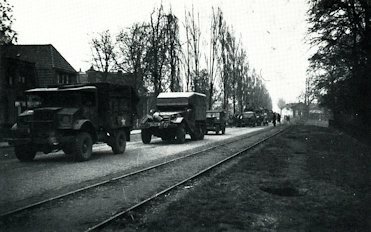 Parkweg, Saterday in the afternoon of 14 April 1945. at Parkwegschool stood several vehicles of B-squadron Fort Garry Horse. On that moment the school was in use as German hospital. Groningen, 14 April 1945. 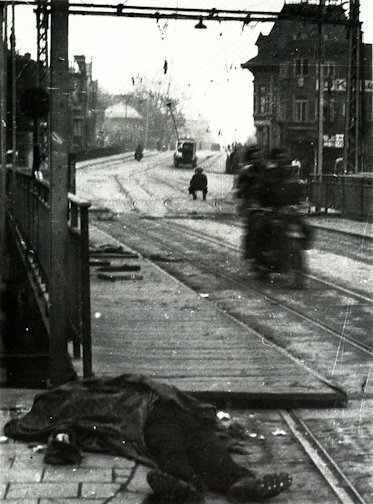 From Herebrug was shot on German snipers. Groningen, 14 April 1945. 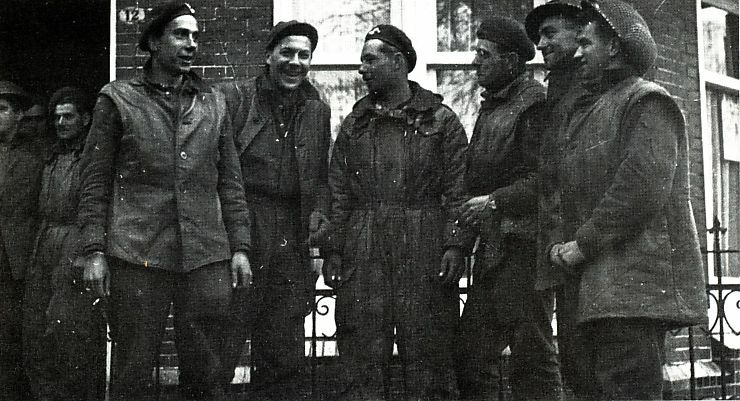 Heereplein, with on the left Spanish riders. In the middle of the picture traces of the Kangaroos who drove with full speed from the bridge around the square to turn off infantry. 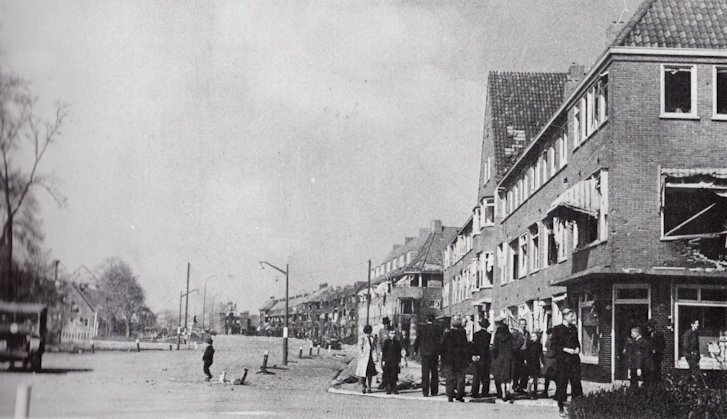 Groningen, Verlengde Heereweg at Helperbrink on Sunday morning 15 April 1945, when Helpman was completely liberated. Two soldiers of The Queens Own Cameron Highlanders of Canada in the social gathering of a few nurses of the near by Roman Catholic Hospital. 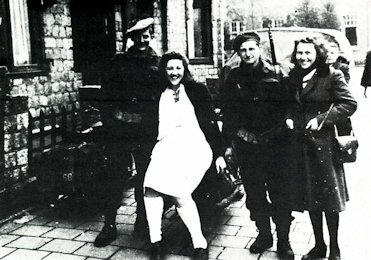 Groningen, 16 April 1945. Exex Scottish at Verlengde Heereweg waiting for quartering. 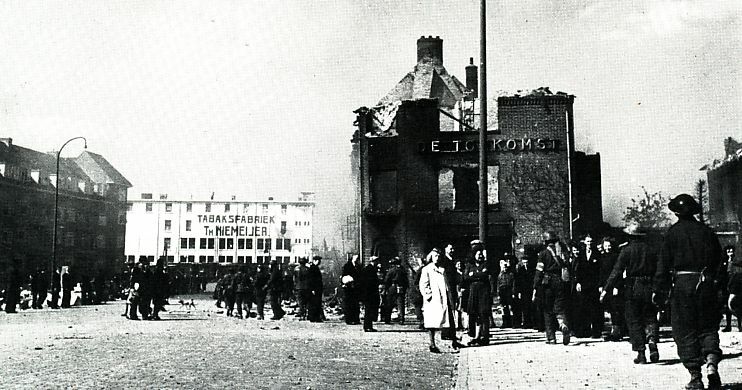 Groningen, 15 April 1945. Verlengde Heereweg. Helpman is liberated. 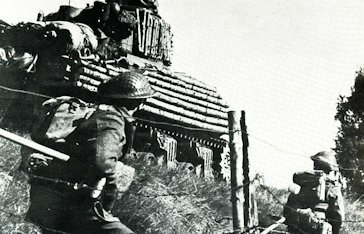 The Queens Own Cameron Highlanders of Canada at a large anti-tank wall at the Nattebrug. Helpman liberated. The large Road Block on Heereweg at Nattebrug is cleared by the Engineers. 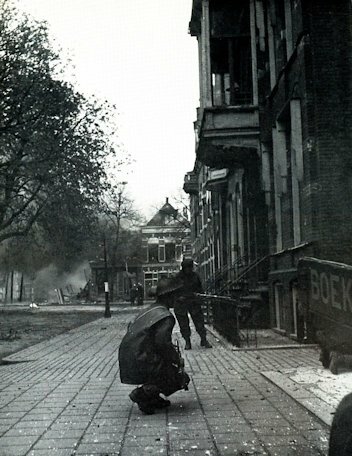 Groningen, Monday morning 16 April 1945. Nassauplein. There is a great mood at the meeting of soldiers of Le Régiment de Maisonneuve with the girls of Groningen. Two soldiers of Les fusiliers Mont-Royal race on a motorcycle on the Lord Bridge, which has been hit by the Kagaroos and Shermans from the joints and thereby lay askew. 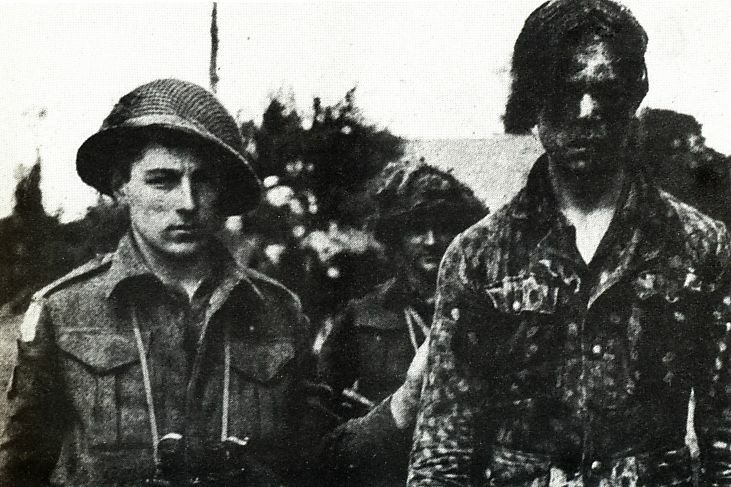 The dead German in the foreground was put aside by men of The Fort Garry Horse, when they went over the bridge. There is still shooting on the Canadians by snipers. 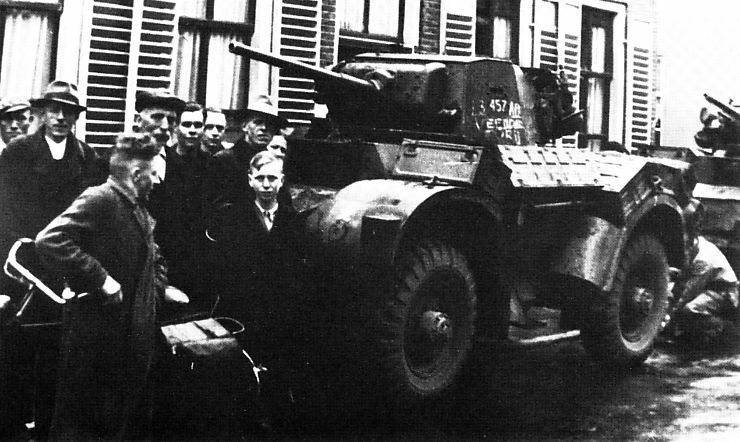 To the staff vehicle (carrier) converted Canadian RAM II tank, eliminated by a Panzerfaust after the passage of the Heerebrug and the occupation of the Heerenplein. 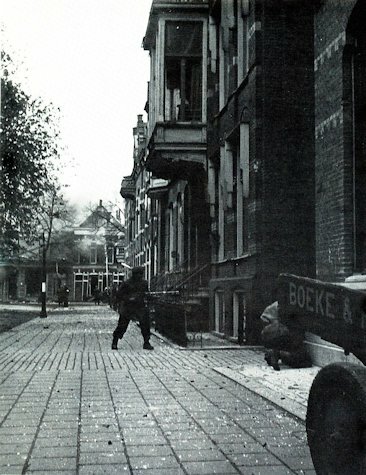 Groningen, Monday morning16 April 1945. Poelestraat. 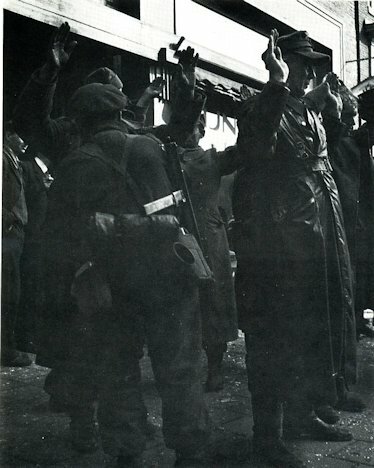 Germans surrender. Groningen, Parklaan. Sunday15 april 1945. 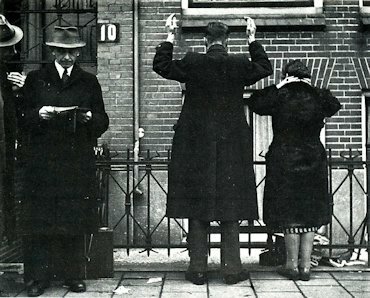 Suspects are checked by Dutch authorities. 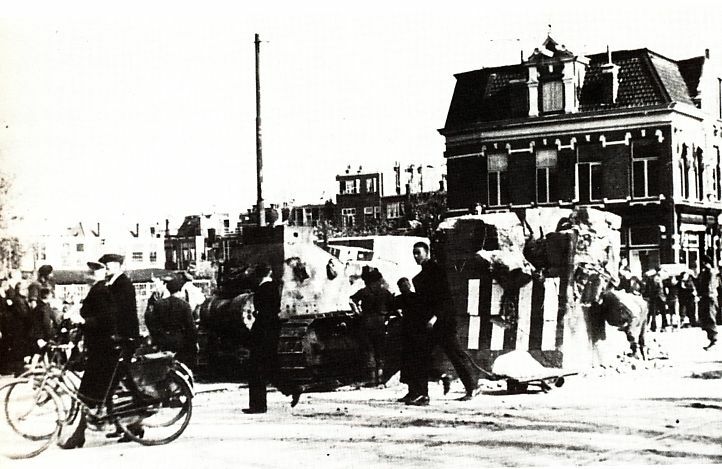 Groningen, 15 April 1945. 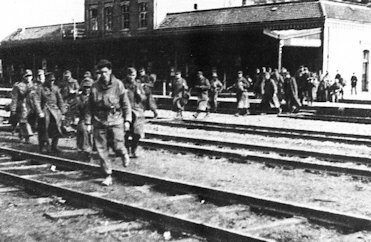 German Prisoners of War at the overpass. 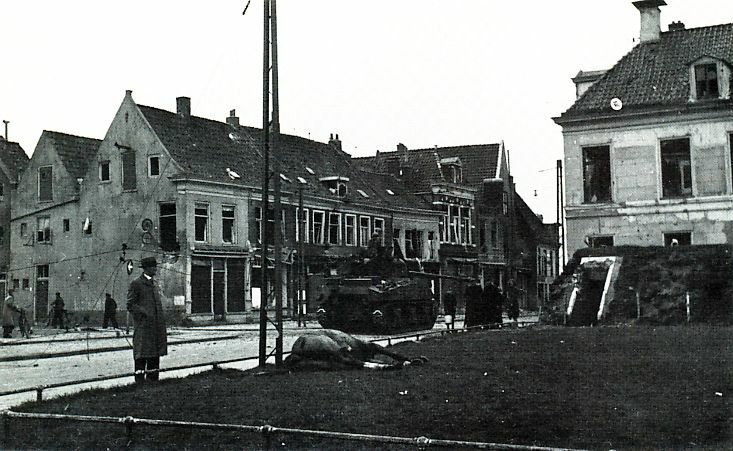 Groningen, 15 April 1945. 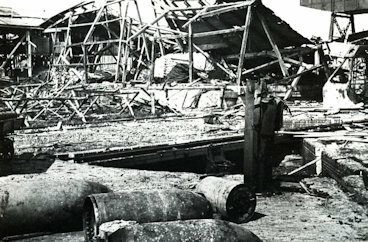 At Zuiderdiep A German stock warehouse was plundered. 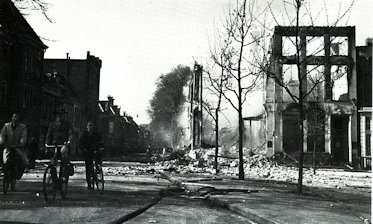 Groningen, 15 April 1945, Zuiderdiep. 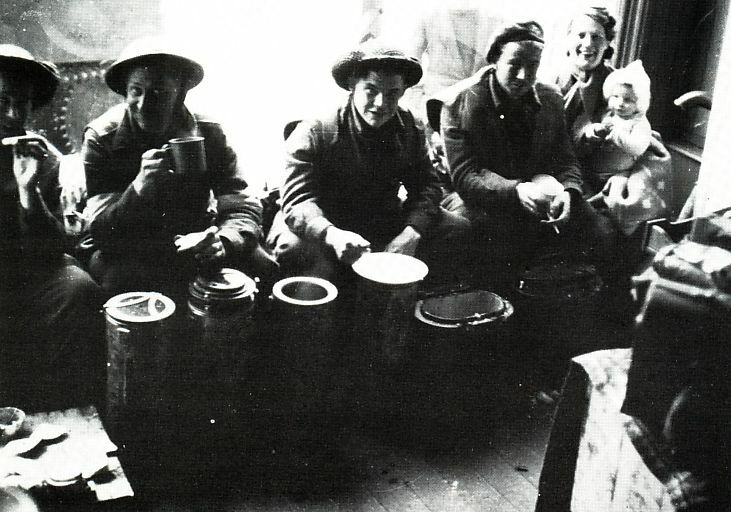 During a battle break men of South Saskatchewan Reginent receive a hot meal served in a shop window. Groningen, Oosterbrug. Sunday 15 April 1945. The battle for the bridges and major water barrier in connection channel is fought for the benefit of Canadians. On the bridge is still a fallen German soldier and further in the background, the battle still raging. 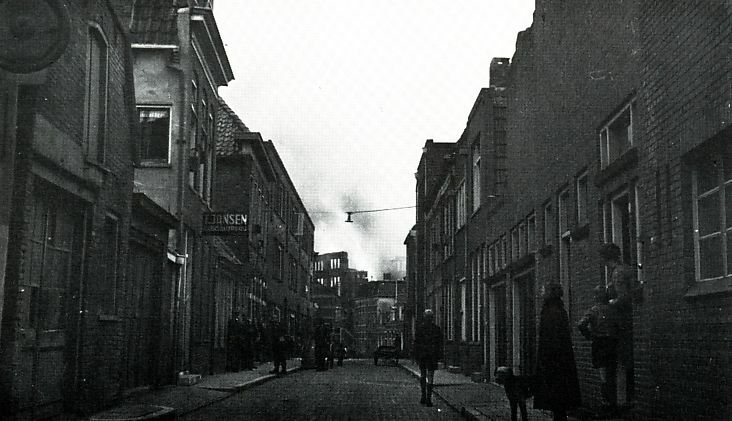 Groningen, Verlengde Oosterstraat, Sunday 15 April 1945. Canadians of Les Fusiliers Mont-Royal. 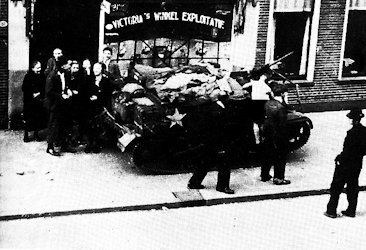 De Wasp (flame throwing Bren Carrier) was also used in Groningen. 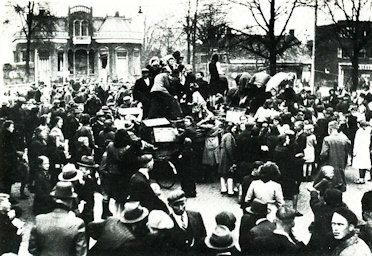 Groningen, 15 April 1945. Koninginnelaan. Here, a Canadian soldier taken away on a stretcher. 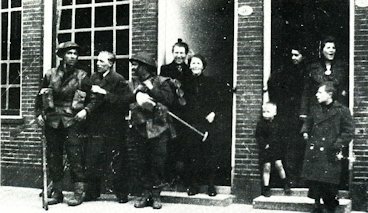 Groningen, 15 April 1945. 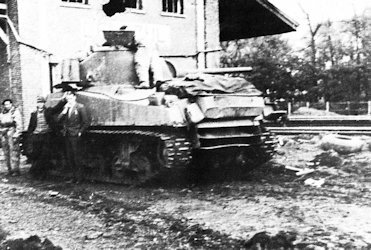 Fort Garry Horse tanks at Nassaulaan support The Black Watch at Noorderplantsoen. In the forground they are busy to explore telephone lines. 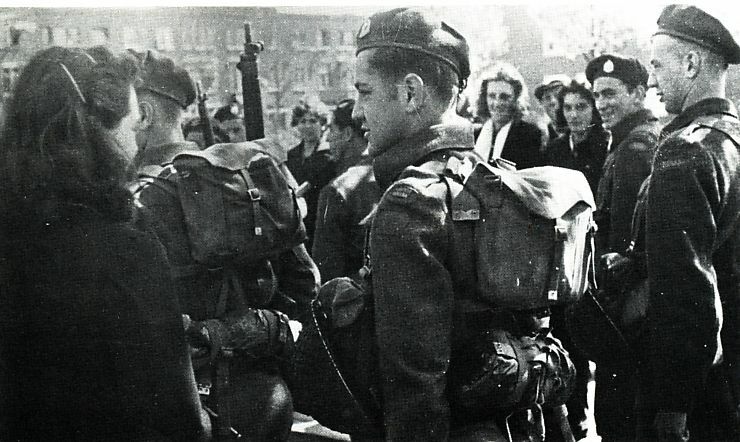 Groningen, 15 April 1945. 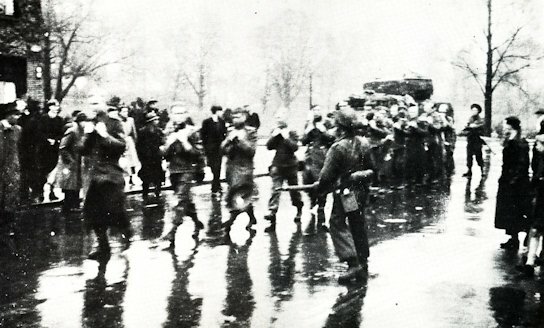 Germans who did surrender during the fights on the westside of Noorderplantsoen are discharged through the gardens behind the housed at Oranjesingel to Koninginnelaan and Ernst Casimirlaan. Groningen, Verlengde Oosterstraat. Sunday 15 April 1945. 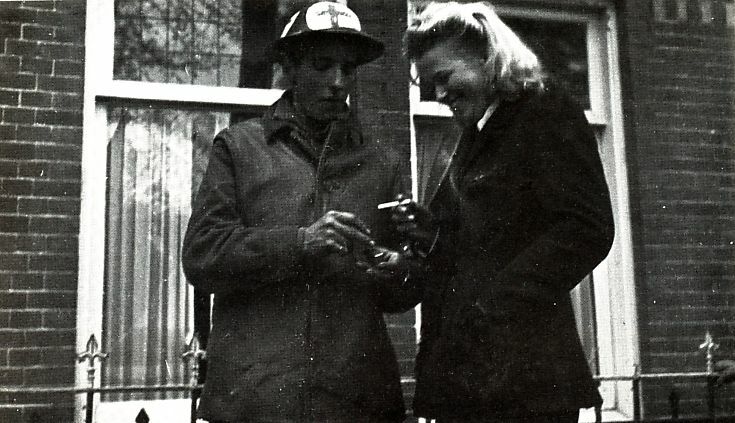 Pte A. Monette gives a Groningen girl her first original Virginia cigaret since a long time. 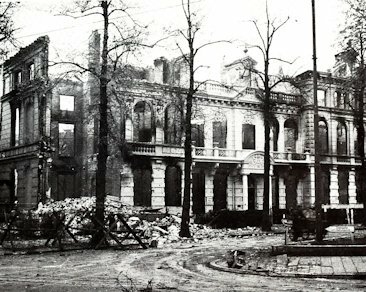 Groningen, Radesingel, Sunday15 April 1945. 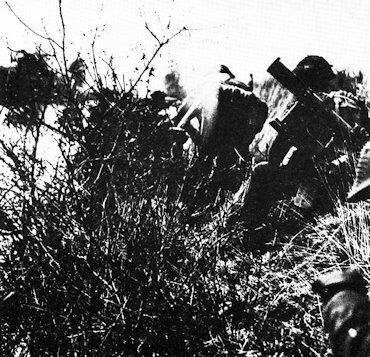 Soldiers of Les Fusiliers Mont-Royal clearing the company Boeke en Huidekoper from the enemy. Groningen, Rademarkt. Sunday 15 April 1945. Groningen, Rademarkt. Sunday 15 April 1945. Tanks van The Fort Garry Horse guarding the cross roads. Groningen, Rademarkt/Zuiderdiep. Sunday 15 April 1945. Sherman tanks with a Stuart Honey in between hold the main streets under fire. 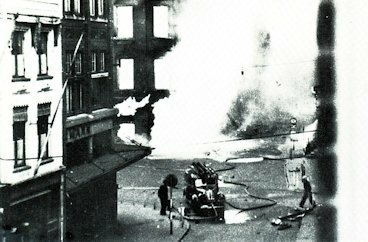 In the background fires caused by the fightings on Rademarkt and the crossroad. Molensraat at Rademarkt, Groningen. Sunday 15 April 1945. Molensraat at Rademarkt, Groningen. 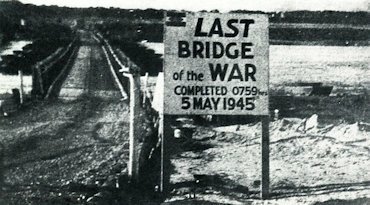 Sunday 15 April 1945. Canadians searching for German soldiers while civilians are watching in tention. 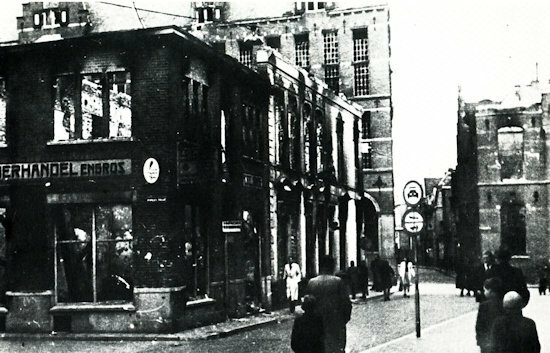 In the background Gruno's tabacco factory is burning. 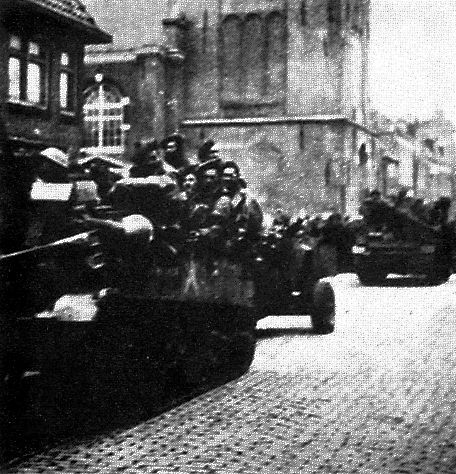 Groningen, 16 April 1945. 20 mm Flak 38 at 1e Drift, with its rays of fire in this area sowed so much panic. 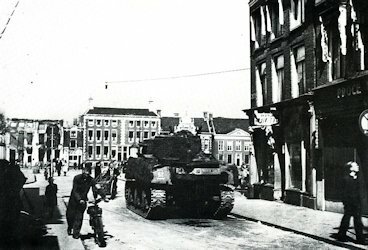 Groningen, Monday 16 April 1945. 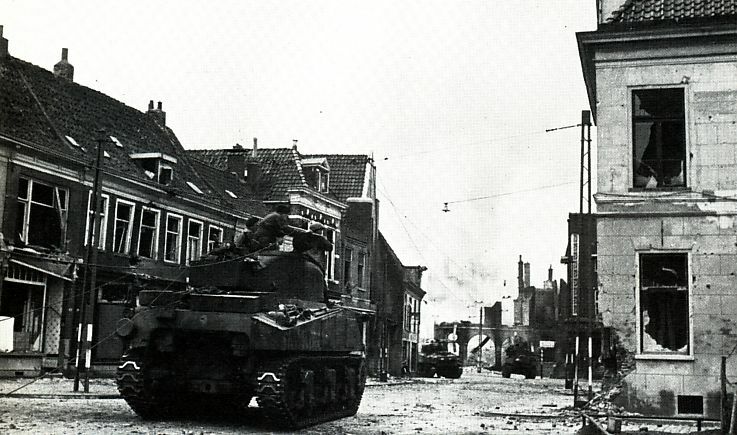 Tanks of The Fort Garry Horse in action on Gedempte Boterdiep. 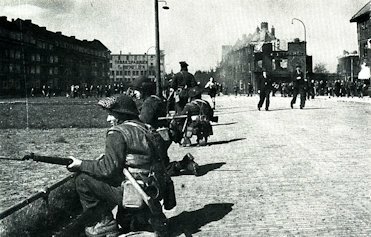 Groningen, Monday 16 April 1945. 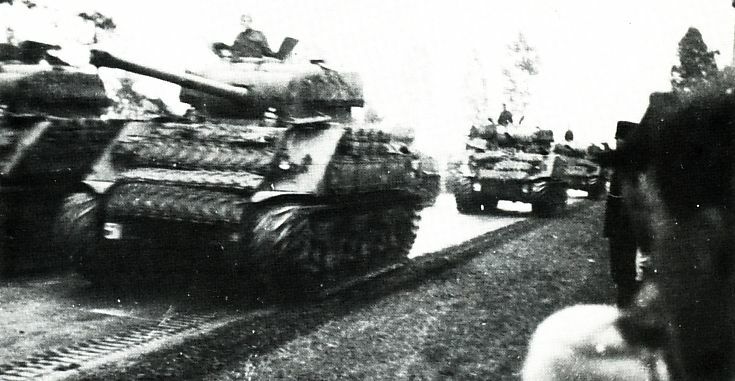 Tanks of The Fort Garry Horse in action on Gedempte Boterdiep. On the corner infantrymen of Le Réiment de Maisonneuve. 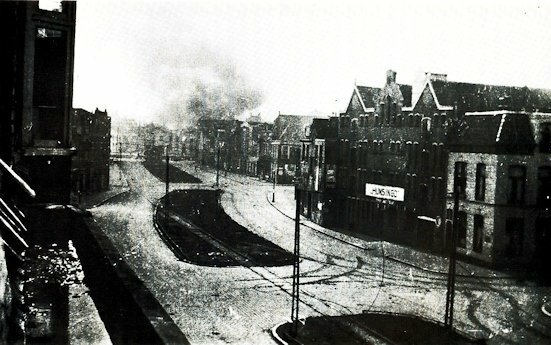 De Stoeldraaierstraat in Groningen, after the explosion of a German ammunition car. Signal post at café de Beurs, corner Folkingestraat. Groningen, 14 April 1945. Folkingestraat. Four Germans are discharged. 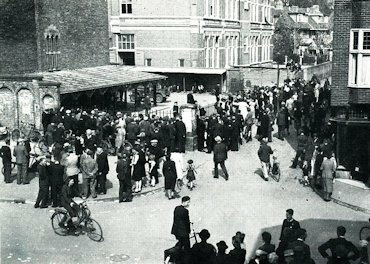 Groningen, Monday afternoon 16 april 1945, Oemarkt/Nieuwe Boteringestraat. 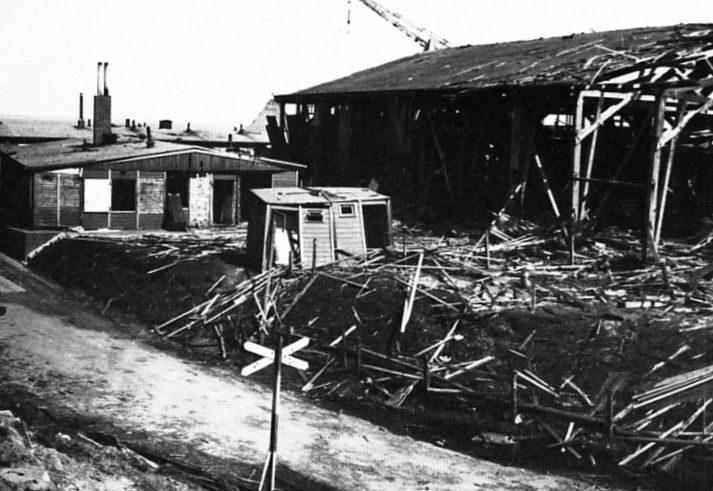 Damage in the area Le Régiment de Maisonneuve (Lincoln III) by FLAK on the otherside of the water. 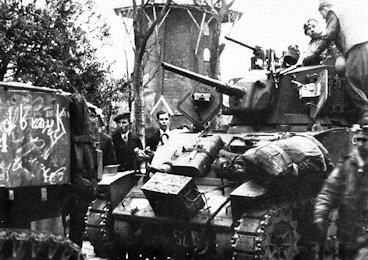 A tank of The Fort Garry Horse in Oude Boteringestraat opposite Ossemarkt in Groningen. 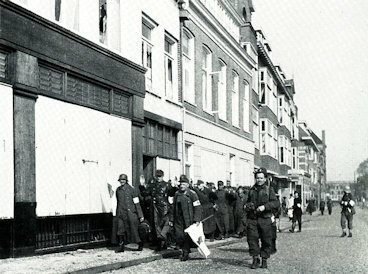 Groningen, 17 April 1945, Oosterstraat. 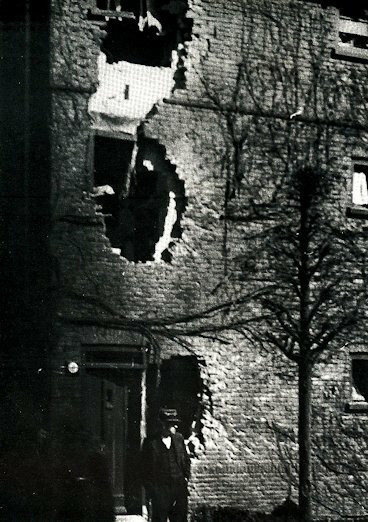 Great damage caused by gunfire from Rademarkt. 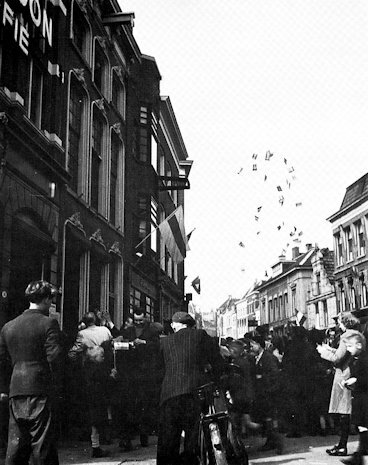 Groningen, 16 april 1945, Oosterstraat. 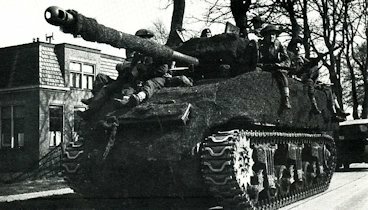 A Sherman Firefly on its way to the north-east side of the city. 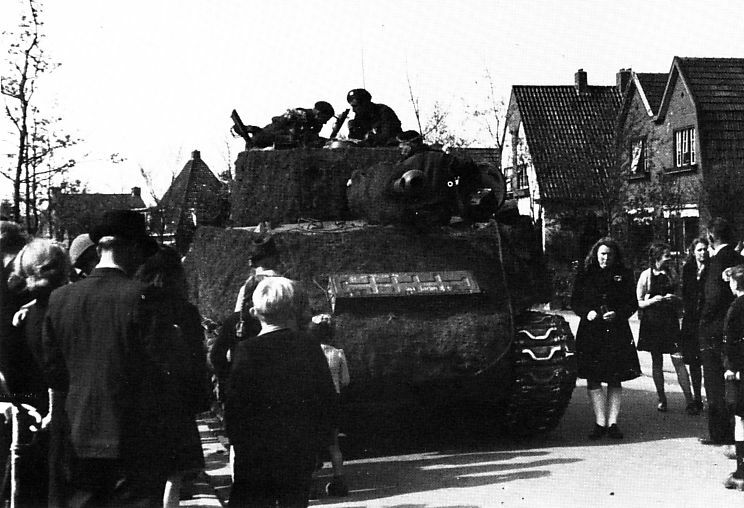 Groningen, 15 April 1945. The Canadians have advanced toward the hart of the city. 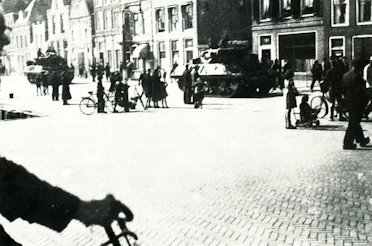 Groningen, 16 april 1945. 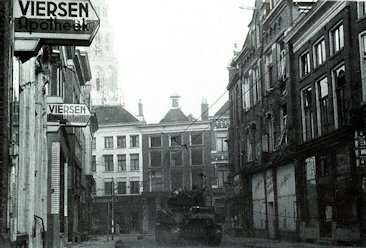 About noon the first Firefly drives on Grote Markt from Oosterstraat. The north side is in ruins. 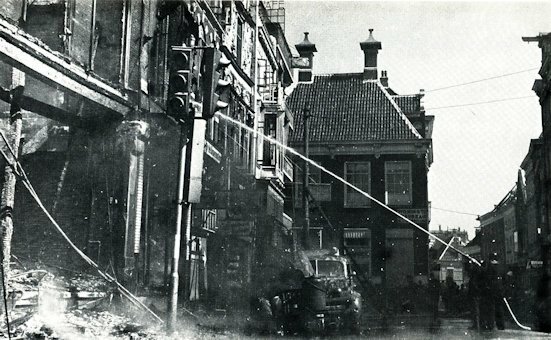 The fire hoses to the Poelestraat. 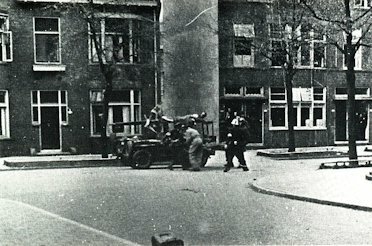 Groningen, 16 April 1945, Poelestraat. The fire brigade extinguishes the fire while the German commander has surrender himself to the Canadians. On the picture a left German car with gas generator in front. 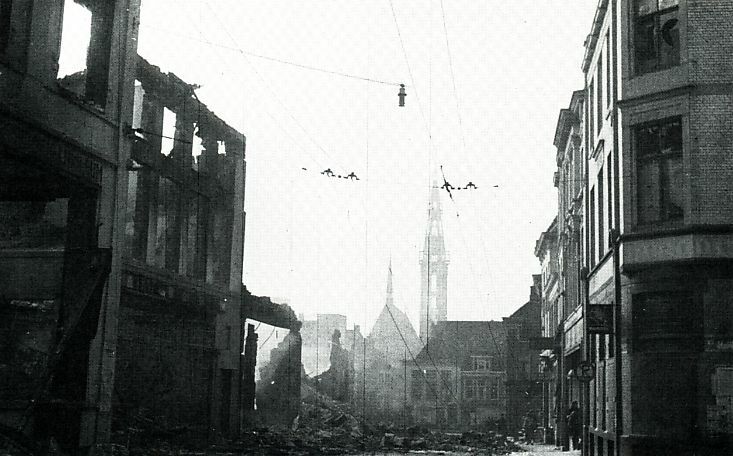 Groningen, 14 April 1945. De Waag, corner Grote Markt - Guldenstraat put into fire by the Germans. 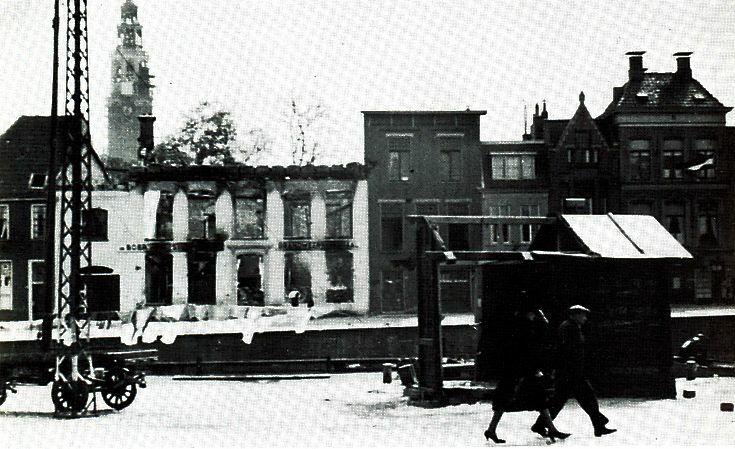 Groningen, 16 April 1945. 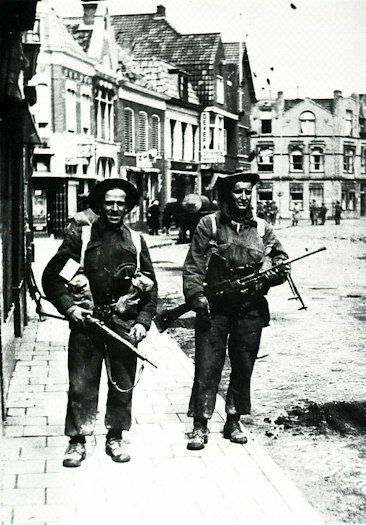 Soldiers of South Saskatchewan Regiment in Guldenstraat on the way to the north. op weg naar het noorden. Here they walk from the most eastern border of their marching area. 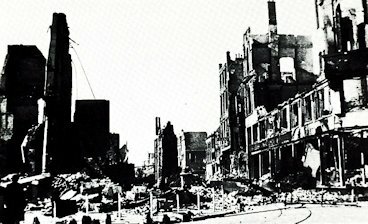 Groningen, 16 April 1945. Under cover of a smoke screen South Saskatchewans are crossing the Grote Markt on their way to the Germans who still occupy the north side of the city. 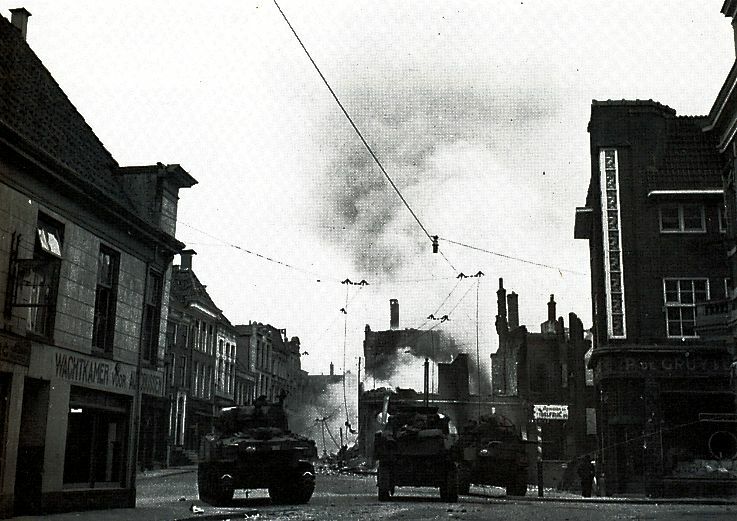 Groningen, 16 April 1945. 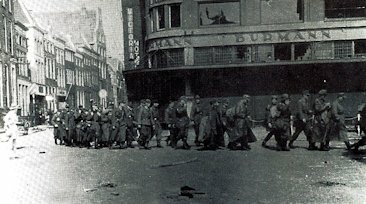 German prisoners on the corner of Grote Markt and Oude Boteringestraat. 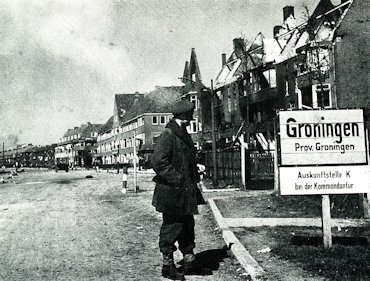 Groningen, 16 April 1945. Between the two markets. 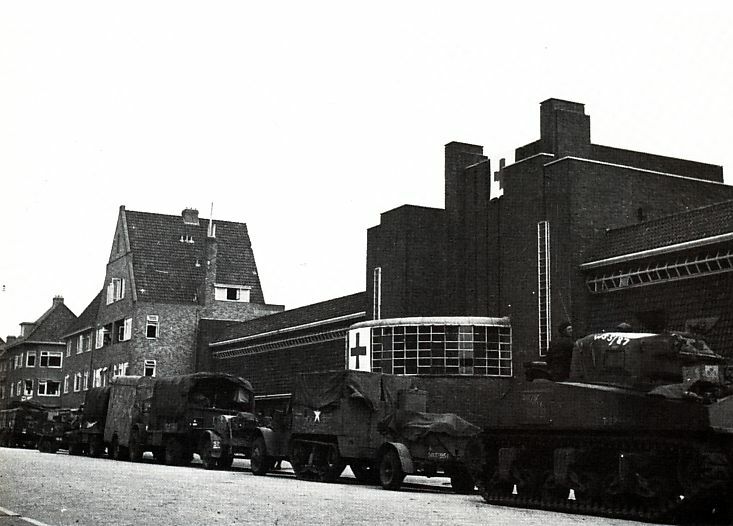 An ambulance jeep of Calgary Highlanders returns from field hospital. 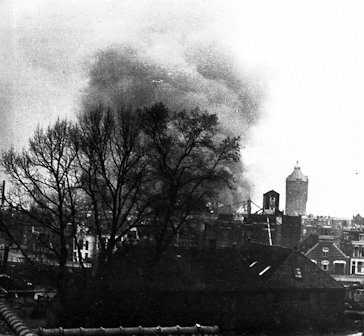 Groningen, 16 April 1945. Area Poelebrug-Turfsingel-Poelestraat. 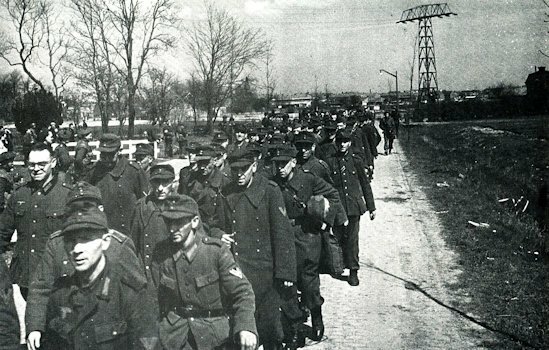 More and more German Prisoners of War are brought in by the South Saskatchewan Regiment binnengebracht. 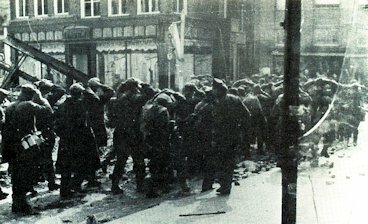 Surrender of Germans in the Poelestraat. 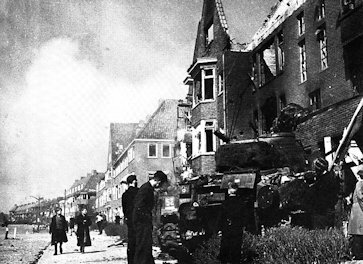 Groningen, 16 April 1945. Poelestraat. Although the fightings are still going on in the city here people are already celebrating their liberation. 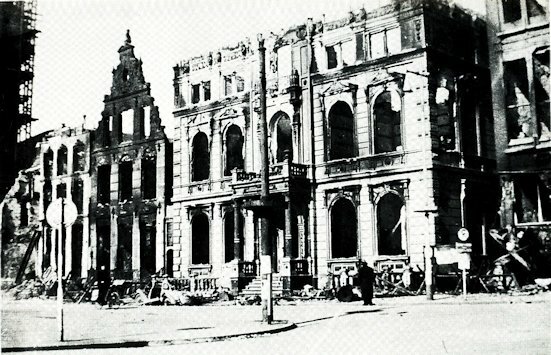 Groningen, 16 April 1945. Connection channel between Heerebrug and Oosterbrug. 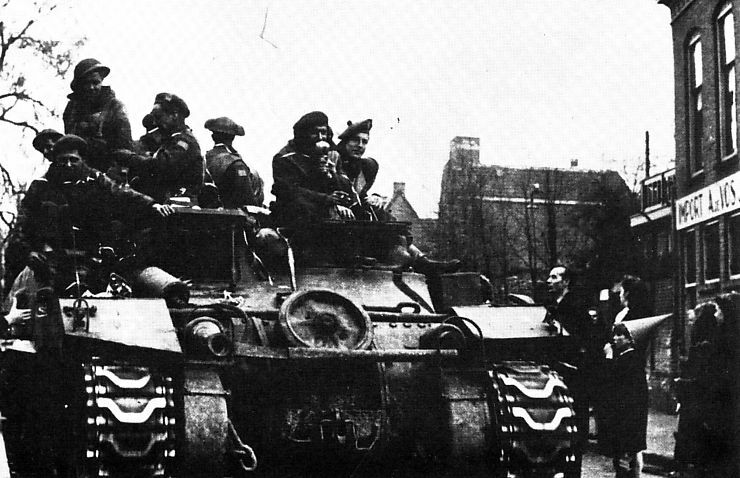 Soldiers of Queens Own Cameron Highlanders of Canada on their way from Helpman to Ooterparkwijk, where they had to make tough battle late in the afternoon together with the tank of The Fort Garry Horse. 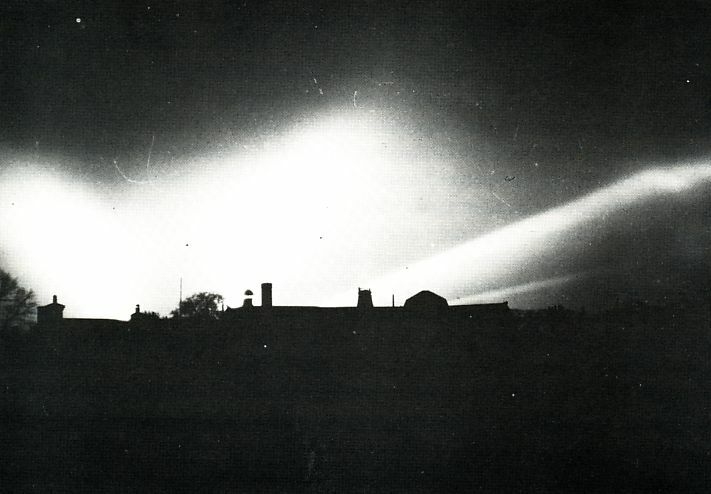 Groningen, 16 April 1945. Petrus Campersingel. Groningen is celebrating its liberation. Here the battalion headquarters of the Queens Own Cameron Highlanders of Canada is prepared. 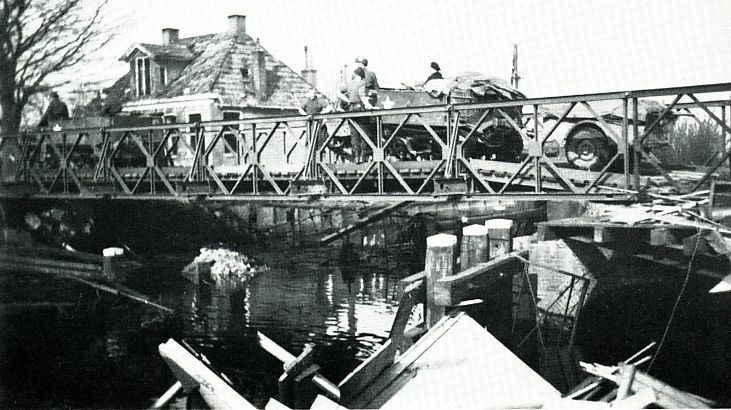 Bedumerbridge across Van Starkenborg channel has blown up, April 1945. 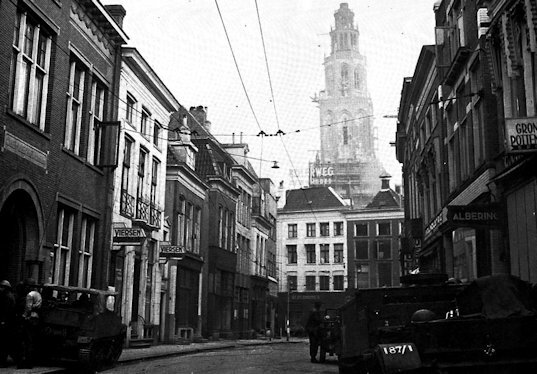 Grote Markt Groningen on 16 April 1945. Groningen, Lutkenieuwstraat. 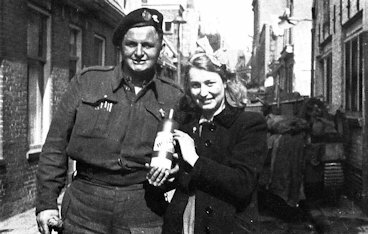 Soldier of the Royal Canadian Engineers with a Groningen girl and a full bottle Bols. 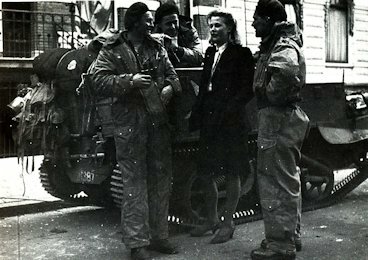 Groningen, 17 April 1945. Heerebrug. 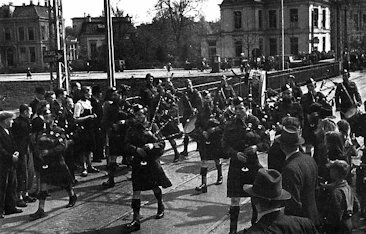 De Pipeband of Essex Scottish presents itself to the public in Groningen. 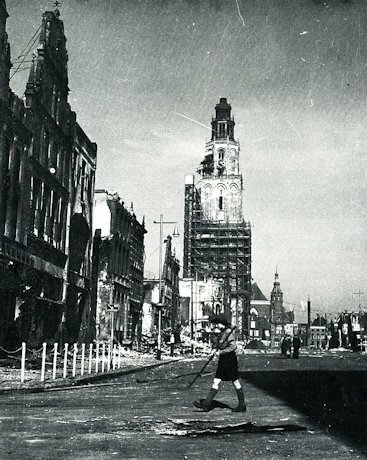 Groningen, 16 April 1945. Noorderplantsoen Nassaulaan. Four Fireflies of C-squadron Fort Garry Horse. A carrier of South Saskatchewan Regiment on Zuiderdiep. Groningen, Grote Spilsluizen. From the corridor to the left of the building a PIAT was fired at the 20mm guns of the Germans on the other side of the water. The shelter was part of the German defense. 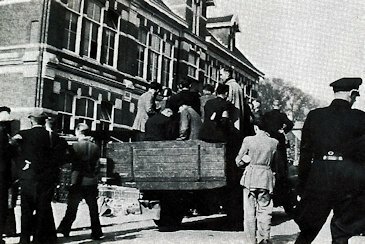 Arrested NSB'ers at Plantsoen schools in Groningen. 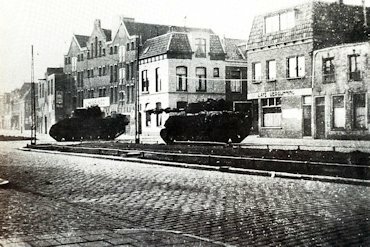 Groningen, Turfsingel, where some machine gun nests throughout Gedempte Boterdiep held at gunpoint until the tanks of The Fort Garry Horse put an end to that ​​on April 16, 1945. 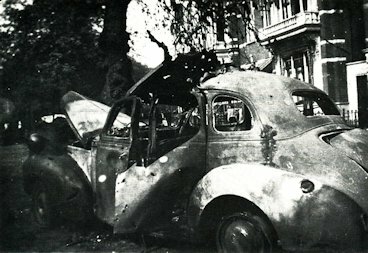 The company of the Boer was paid in flames. Groningen. 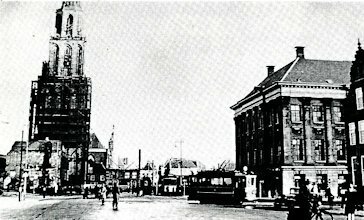 Oude Ebbingestraat en Grote Markt. 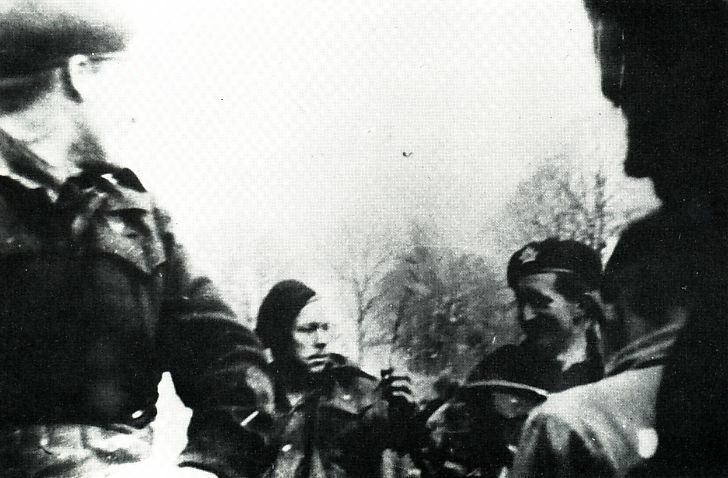 On 15 and 16 April 1945 the passage was blocked by the Canadians. 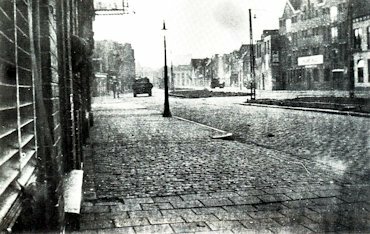 On the right the ruins of the department store De Bijenkorf and left nazi restaurant De Pool. 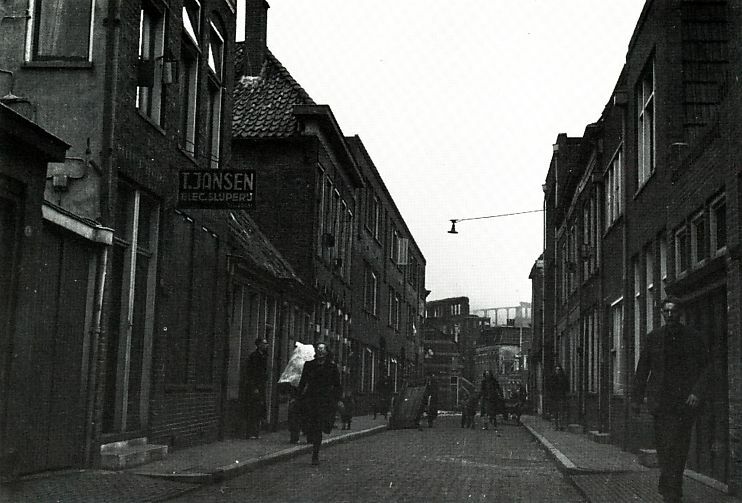 Groningen, Schoolstraat, SIngelstraat, Nieuwe St Jansstraat. Here the final battle was fought in Groningen around noon on April 16, 1945. Groningen, Grote Markt, the devastated Scholtenhuis. 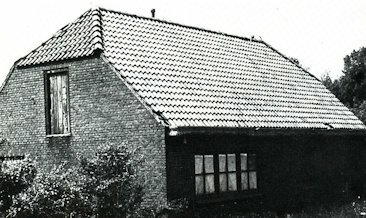 German retreat from the city of Groningen. 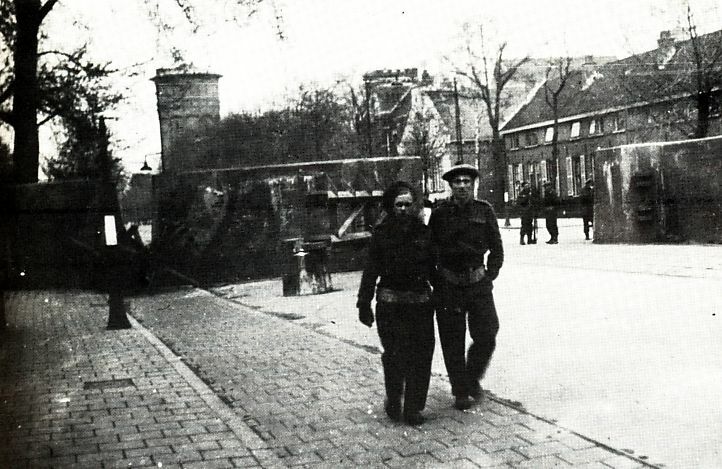 Loppersum, May 1945. The tower as an observation of the Germans had been shot by 25-pounders. 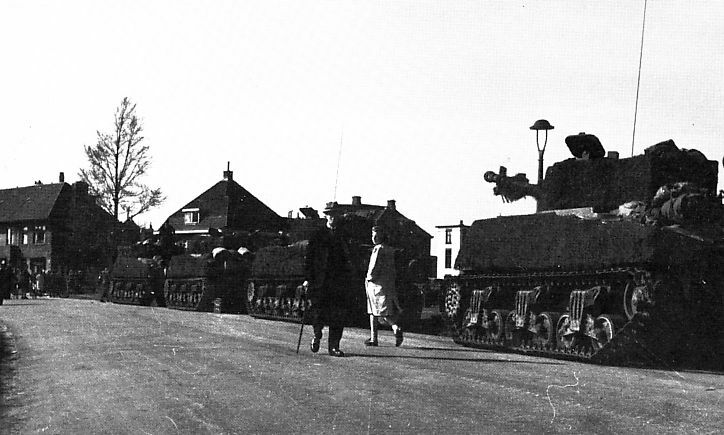 The Royal Winnipeg Rifles supported by tanks of The Sherbrooke Fusilliers Regiment on the way to Appingedam. 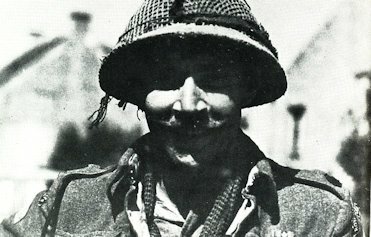 Lt Col Locky Fulton, Commander of The Royal Winnipeg Rifles, who encountered heavy opposition for Delfzijl-Pocket. 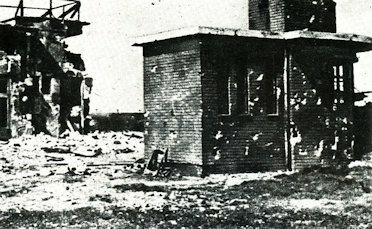 Pamphlet shell strewn by 25-pounder in Delfzijl by the 17th Canadian Field Regiment Royal Canadian Artillery. The leaflets had a great effect on the morale of the enemy. 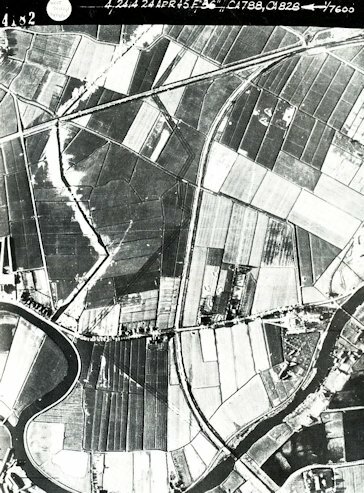 Aerial view of the west side of Delfzijl by a reconnaissance aircraft of the RAF taken on April 24, 1945. By the middle of the Woltjer Railway with on the left a zigzag running barbed wire. To the left of this barrier is a hurriedly dug anti-tank ditch. Right of Railway Woltjer a farm surrounded by machine gun nests and trenches. 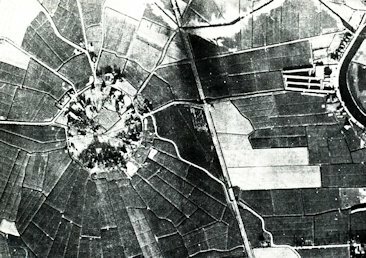 Print for the proper conduct of the fighting on April 24, 1945 aerial photo taken by the RAF The village Biesum in the frontline. 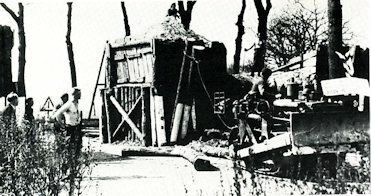 Camouflaged German bunker belonging to the Battery in Carel Coenrad Polder. The curtains with flower pots are painted on the concrete background. The camouflage was so good, that no bullet hit the building. 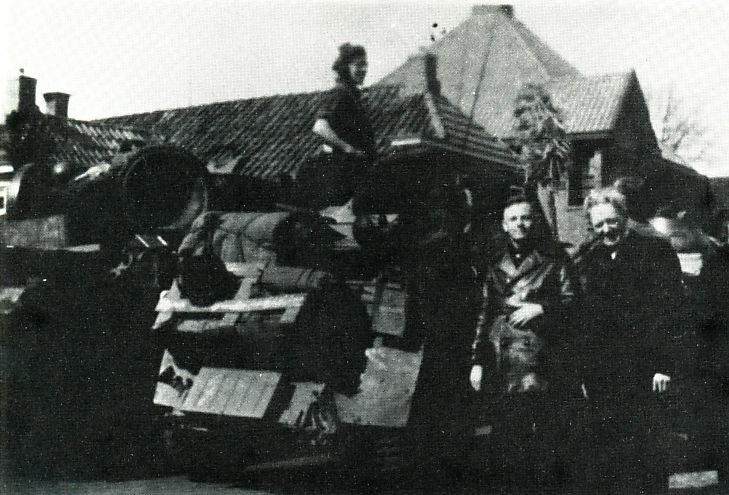 Tank of 8th Hussars near the goods shed at the station Delfzijl. 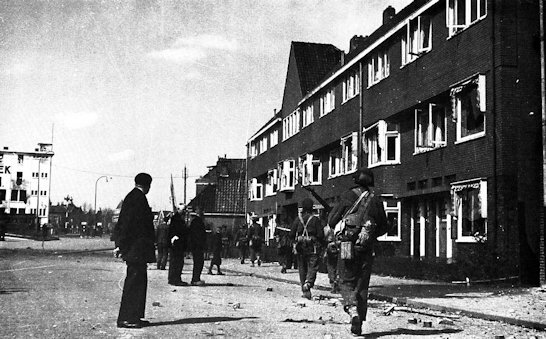 Delfzijl, 1 May 1945. 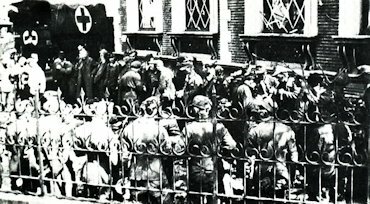 The first Germans go to the station Delfzijl in captivity. 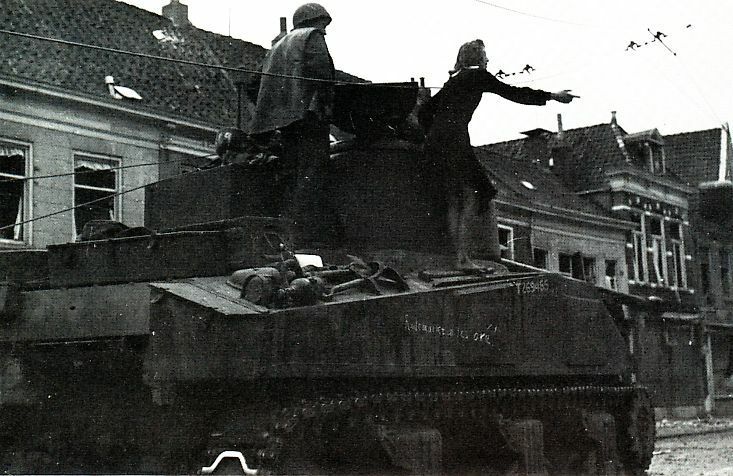 Honey M3light reconnaissance tank in Delfzijl. 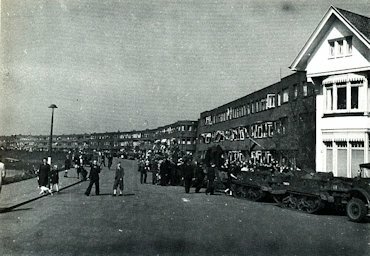 Delfzijl, 1 May 1945. 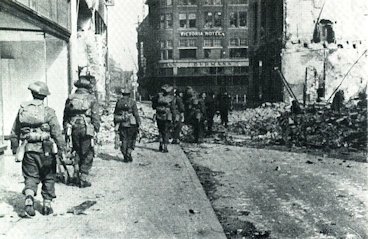 Soldiers of The Cape Breton Highlanders penetrate the city. 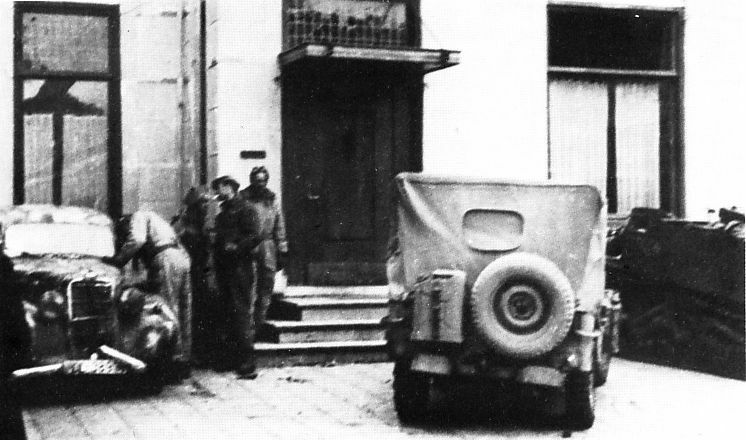 Cape Breton Highlanders search a German car near the building of the SD in Delfzijl. The gunners of Battery Fiemel. May 1945. Battery Fiemel at Point of Reide. 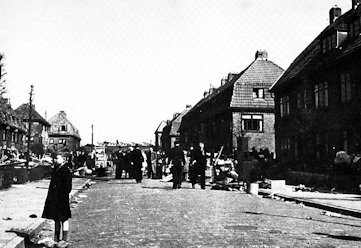 Delfzijl, May 1945. 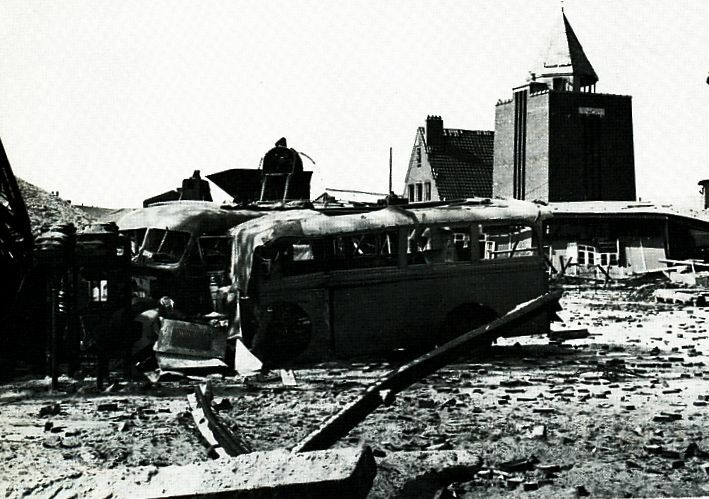 The heavily damaged area around the lighthouse destroyed by German army buses. 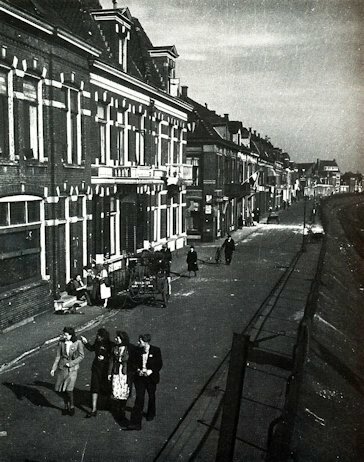 Delfzijl, april 1945. Unexploded bombs werefound in the harbor area. 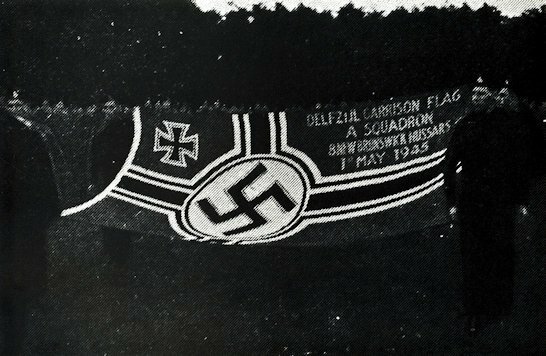 The nazivlag of Delfzijl was exhibited in Eelde. 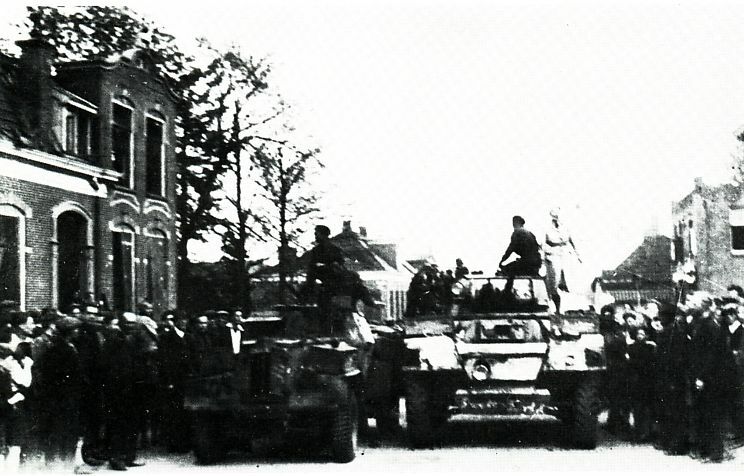 Steenwijk, 12 april 1945. 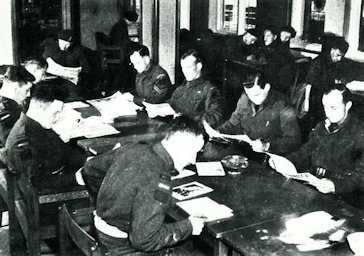 Radiostation of C-squadron Royal Canadian Dragoons at the former post office. 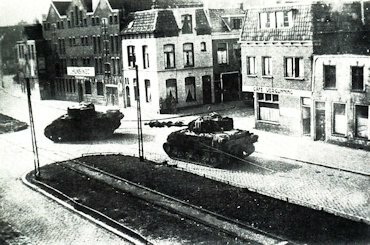 Steenwijk, 14 April 1945. 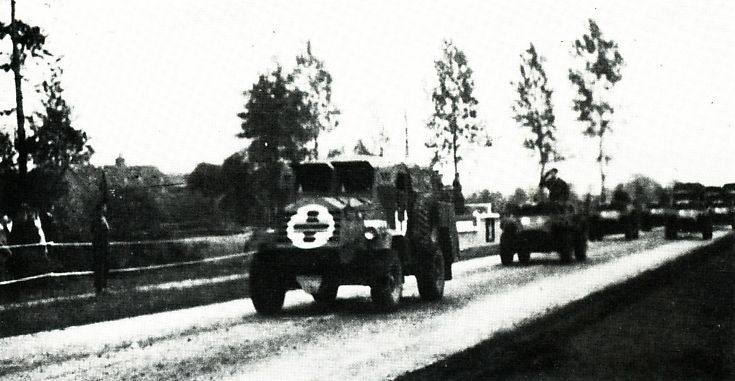 'RAM'- tractors of 6th Anti-Tank Regiment RCA transport infantry. Everything was made mobile to ensure a rapid advance. 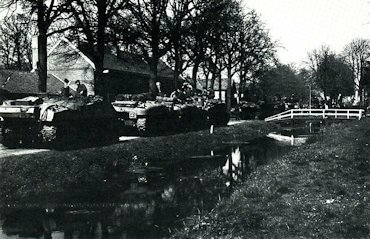 Oude Schouw, 15 April 1945. and light reconnaissance vehicle (Humber) of B-squadron 17th Duke of York's Royal Canadian Hussars stands guard, while citizens restore the bridge and make passable. Pipe Band C.W.A.C. (Canadian Woman Army Corps). 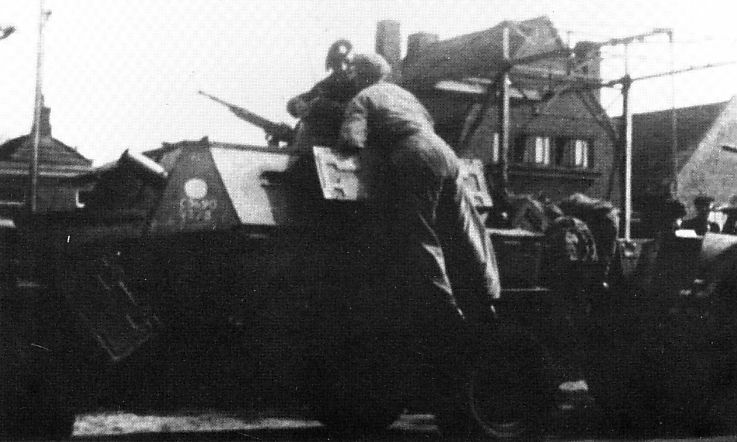 Joure, 15 April 1945. 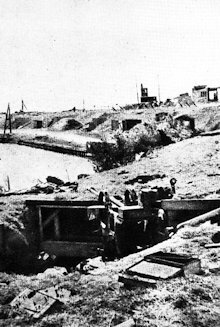 Tactical Headquarters van Le Régiment de la Chaudière along the ditch. 15 april 1945. 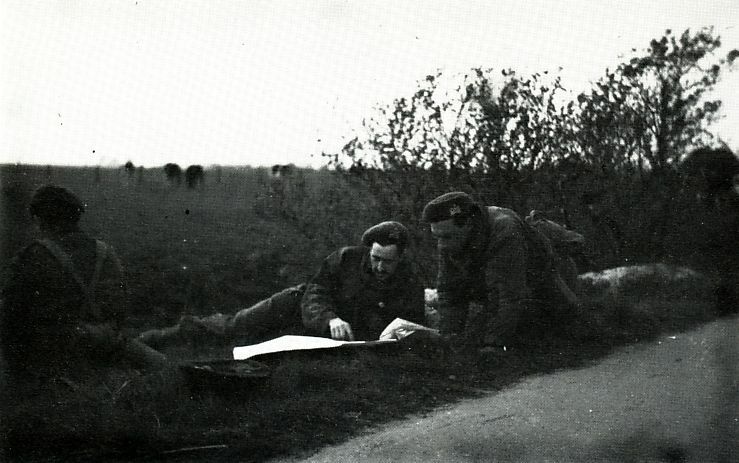 Firefly of The Sherbrooke Fusiliers Regiment monitors near Joure. 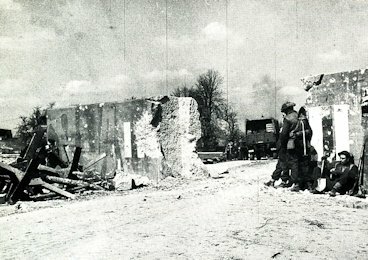 Joure, 15 April 1945. 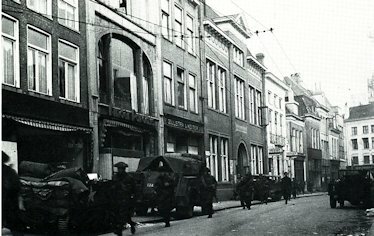 Duke of York Royal Canadian Hussars on their way to Sneek and further on. Joure, 15 april 1945. 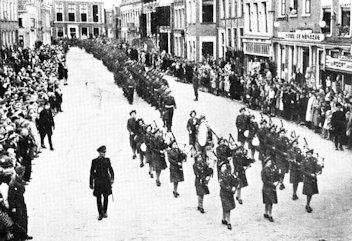 Passage of soldiers of the 9th Canadian (Highland) Infantry Brigade on their way to Leeuwarden and Harlingen. Le Régiment de la Chaudière enter into Joure. 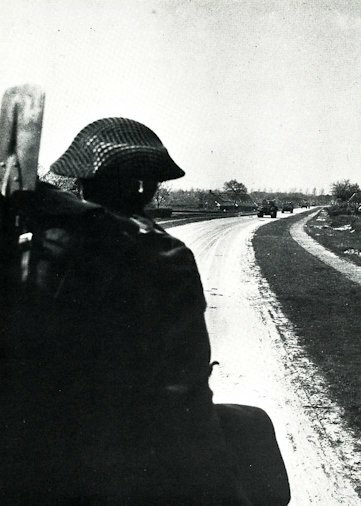 De 3rd Canadian Infantry Division on the way to Friesland. 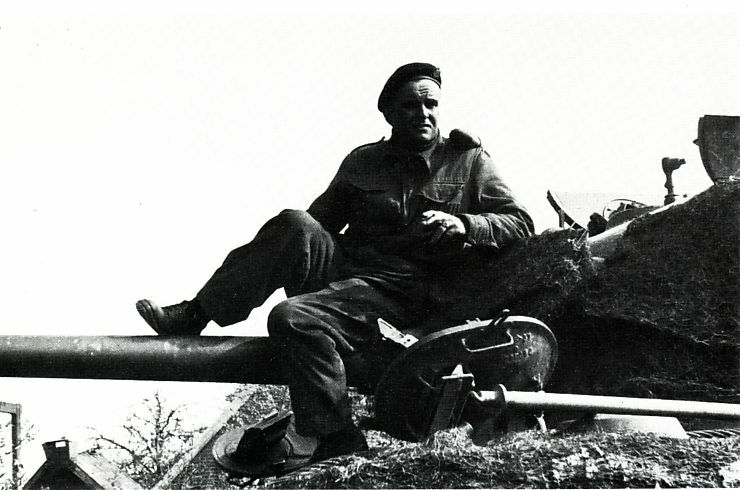 A Forward Observation Officer gets his last assignments before departure. Farewell to The Perth Regiment in Sneek. Pingjum paid a heavy price for the liberation. 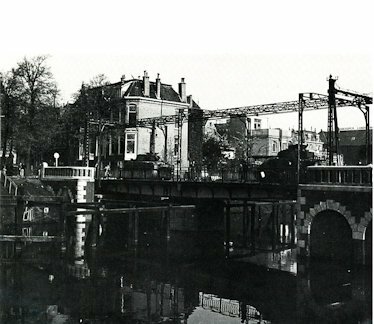 Scharsterbrug. The way is clear to Lemmer. 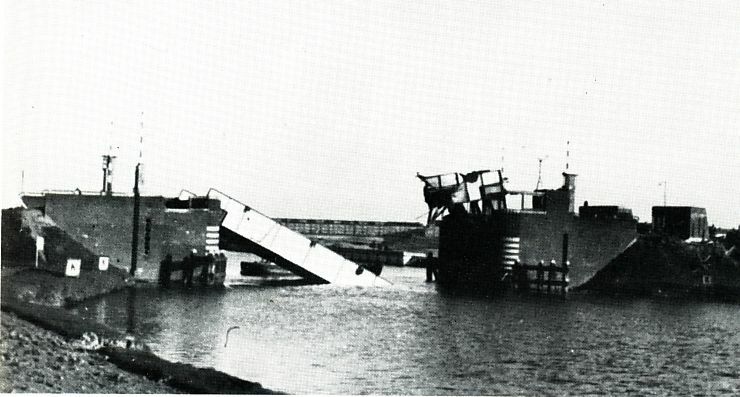 The first Canadian vehicles cross the bridge. Afsluitdijk. 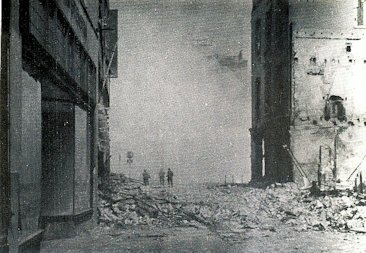 After the artillery bombardment of Canadians, there was not much left standing. Harlingen, 15 April 1945. Tankdestroyers in the center. Zuidhorn. 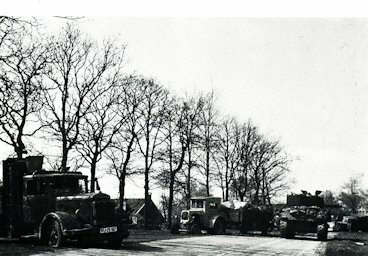 R.A.M.-artillerietractors parking for some time along the way with great interest of the population. 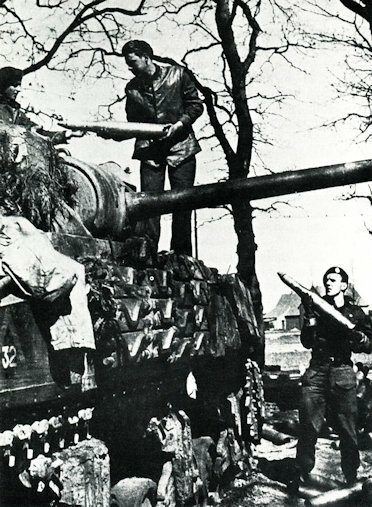 Zuidhorn, April 1945. 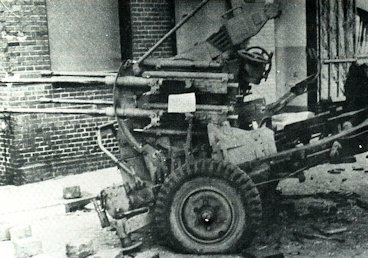 A Bedford of the British 72th Medium Regiment (Royal Artillery). The British unit was here in the north artillery support of Canadians. 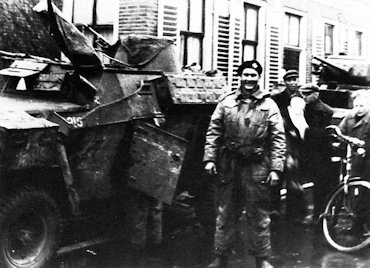 De 8th Recce arrives in Hoogezand, were they were greeted by overjoyed civillians enthusiastically like everywhere else. Honey M3 in Zuidbroek. Watch the vehicle markings. 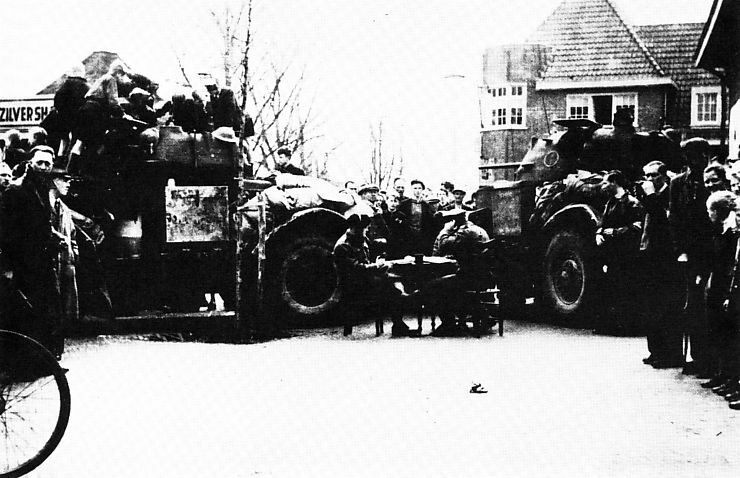 Belgian paratroopers (5th SAS) in Noordbroek. 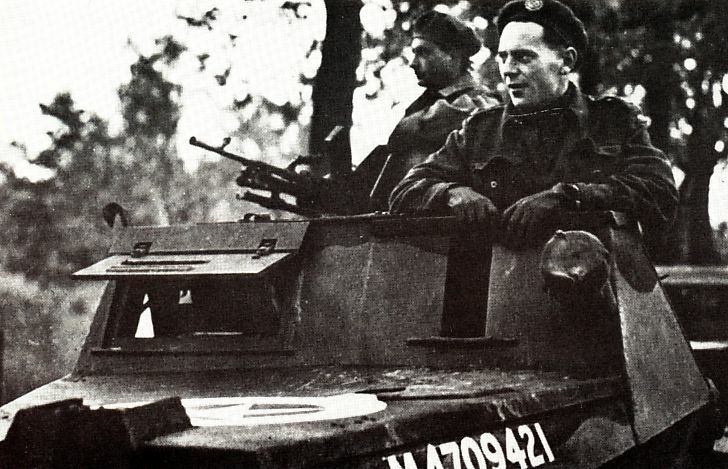 8th Recce of 14th Royal Canadian Hussars in Noordbroek. 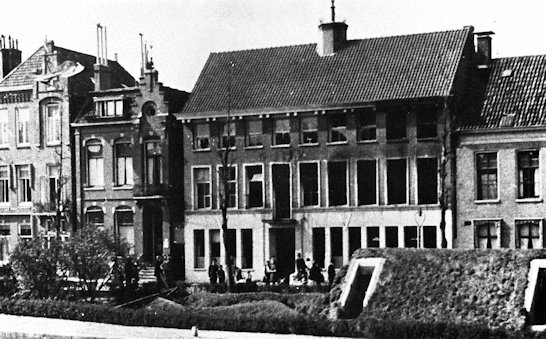 Veendam, 14 April 1945. 10 P.S.K. at hotel Veenlust. 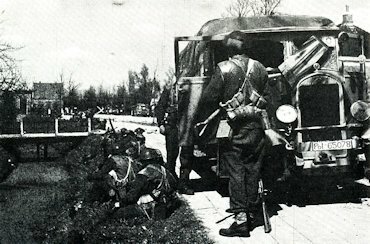 Wildervank, 13 April 1945. 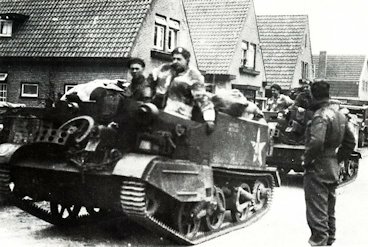 8th Recce units arrive in the town and be warmly greeted by the population. 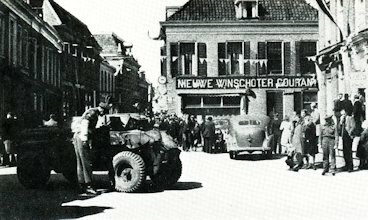 Winschoten, A scoutcar of The Sherbrooke Fusiliers is shown the way in the celebrating Winschoten, liberated by the Polish and Belgian. 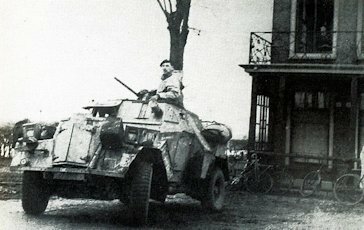 A Canadian Kangaroo passes the Gronings-German border near Hümmling, April 1945. 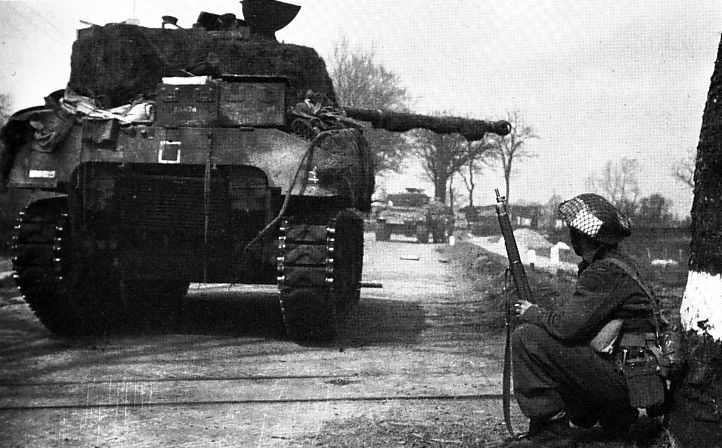 Dutch-German border, April 1945. These signs are made by the 2nd Canadian Corps. 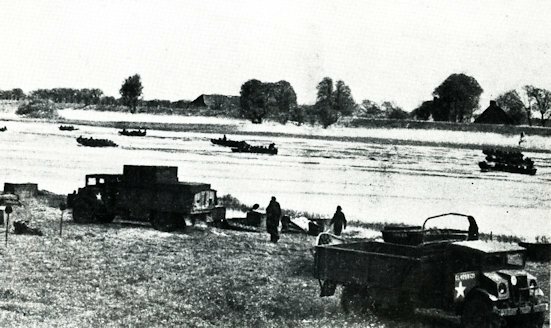 Canadian storm boats with men of The Highland Light Infantry of Canada bagged the Ems off to perform the final attack against the Germans in order to get the town of Leer in hands. 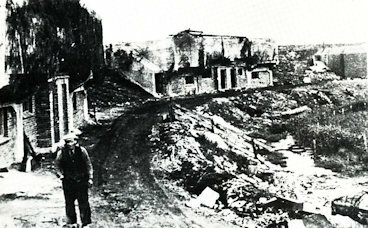 Küstenkanal, the last major stumbling block for the Canadian and Polish army during the final battle just before VE Day. 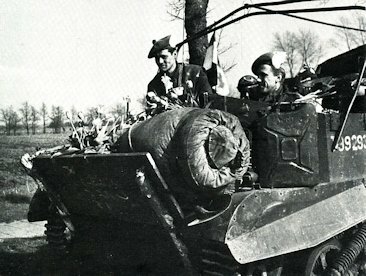 17-pounder shells are loaded into a Firefly for the preliminary barrage on targets behind the channel before the infantry to the other side going forward . The last bridge made ​​by Canadians in East Friesland. 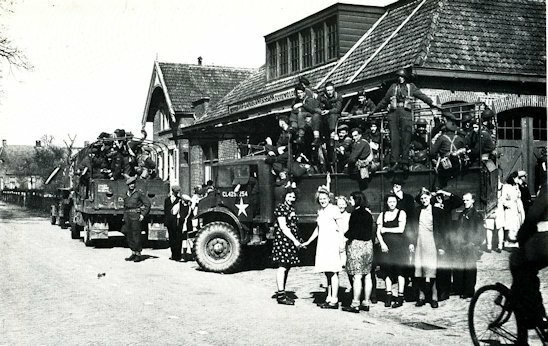 Eelde airport, 23 May 1945. 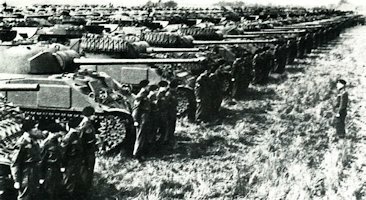 Inspection of the equipment of the 5th Canadian Armoured Division, prior to the immense parade. 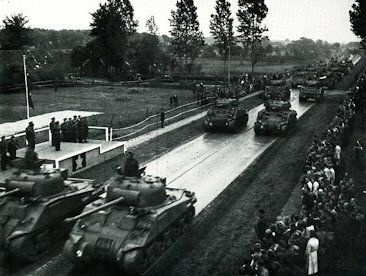 23 May 1945, parade in Eelde. Canadian road signs at Heerestraat. Between the two markets. Normal traffic starts up again in Groningen. Canadian Beaver Club in Groningen.